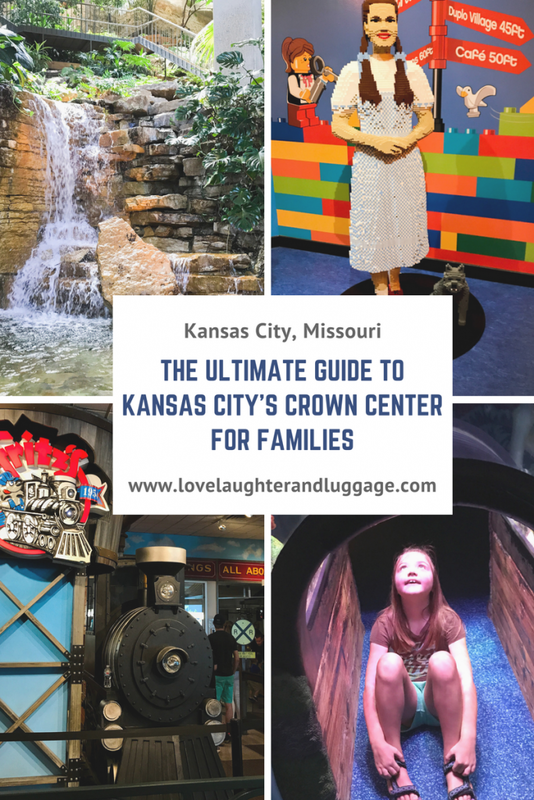 If you’re planning a trip to Kansas City for your family, Crown Center should definitely be on your radar. 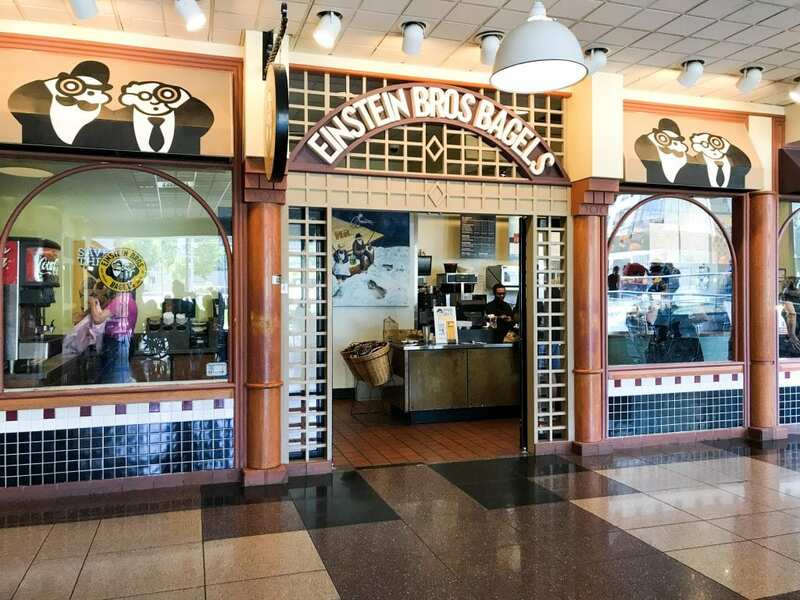 This complex is an amazing collection of attractions, shopping, restaurants, and lodging that you won’t want to miss. 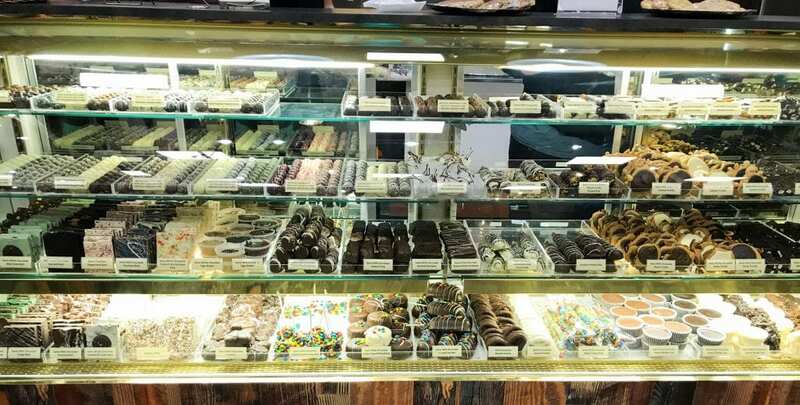 You’ll also want to check out some of the worthwhile attractions nearby, so hang on tight. I’ll explain what you need to know to have a great trip! First, I’ll give you a little background. 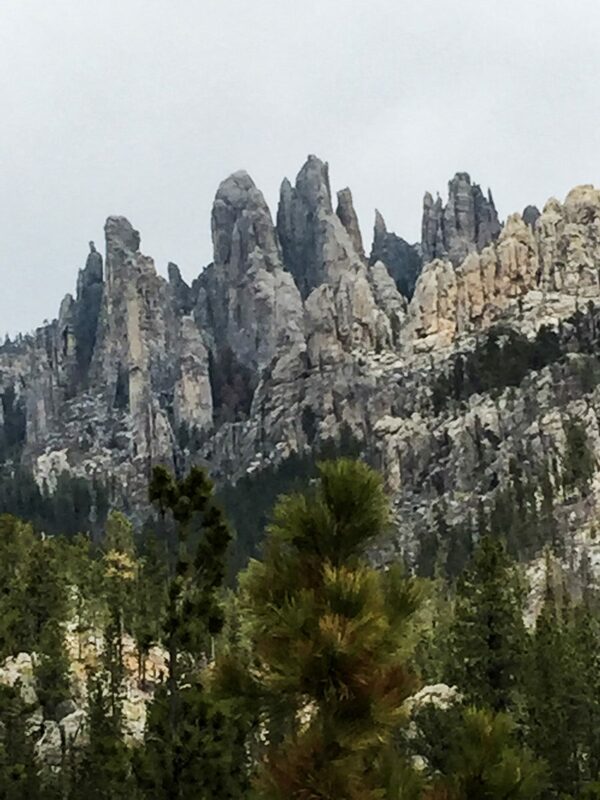 We planned a quick two-night trip in July, so our choices reflect our desire to explore while avoiding the summer heat. 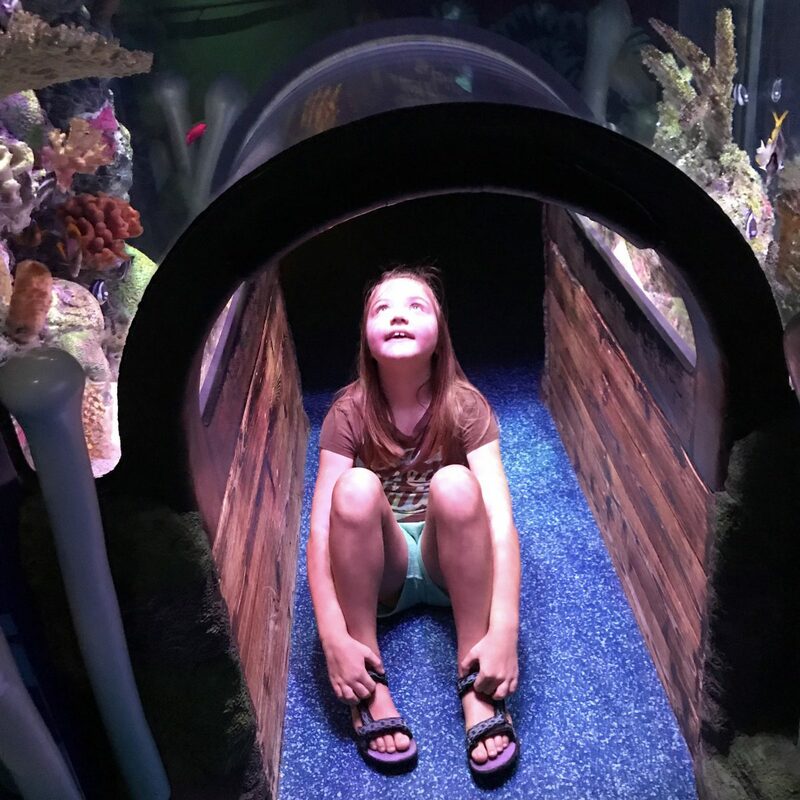 Also, though it’s our family’s policy to “take turns” when choosing activities that may not appeal to everyone equally, we did focus on mostly family-friendly activities, although Kristin is no stranger to museums and battlefields. The kids will probably be most excited about the attractions at Crown Center. 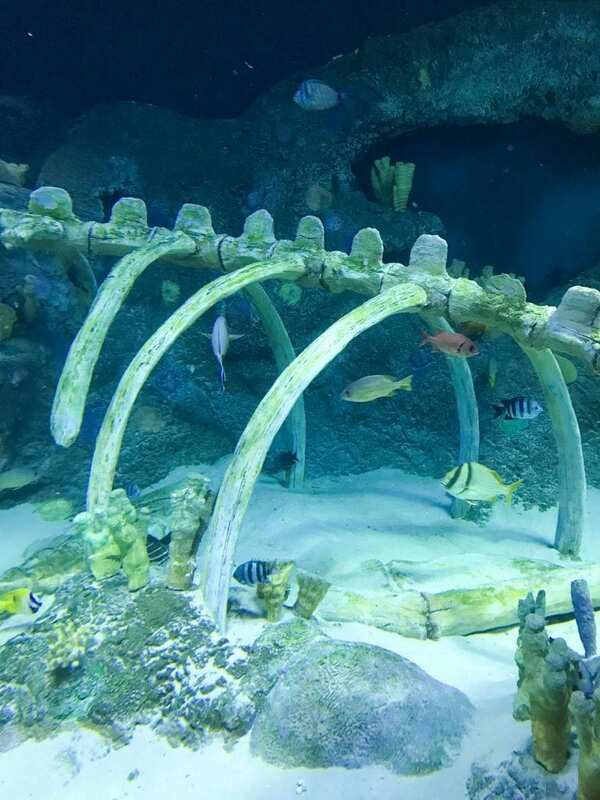 SEA LIFE Aquarium and LEGOLAND Discovery Center are across the street from the main shopping and dining complex. 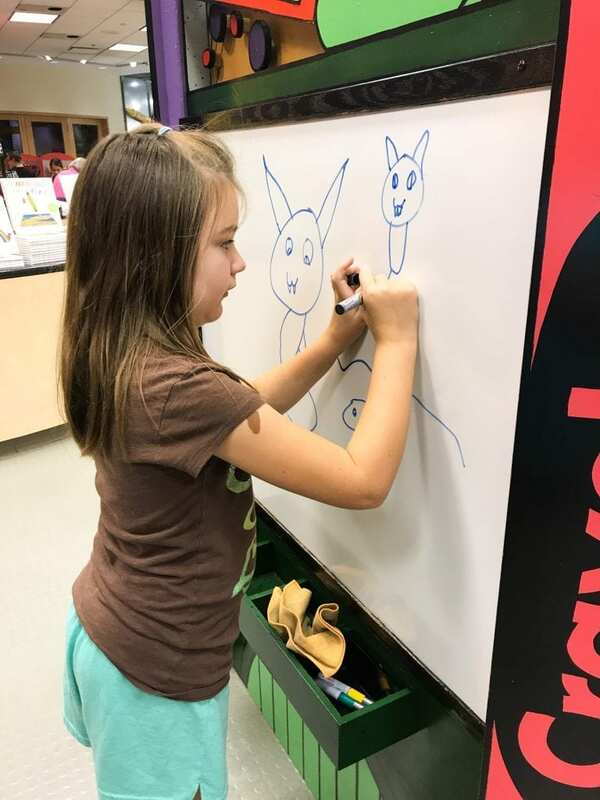 If your kids are into crafts, Hallmark Kaleidoscope is nearby and free! 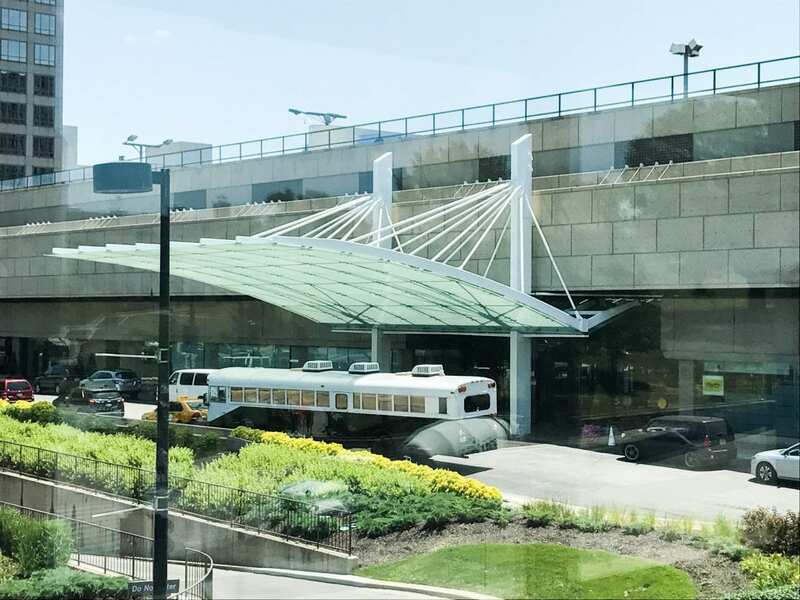 Using the skywalk from the Westin Kansas City Crown Center side of the complex, you can walk to Union Station, a renovated train station that offers attractions and dining along with an Amtrack station. During our visit, we saw the exhibit Dinosaurs Revealed which will be on display at least until January 2019. To read more about our experience, click here. Union Station also houses Science City, an interactive children’s museum, along with a planetarium, an escape room, and other attractions. 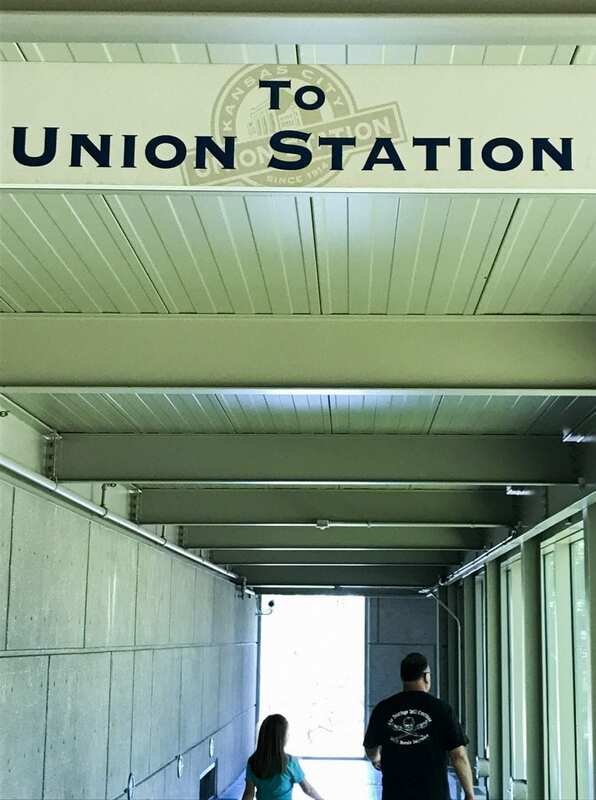 To see what else may be of interest to you at Union Station, click here. The National World War I Museum and Memorial is also nearby. To read about our experience, click here. 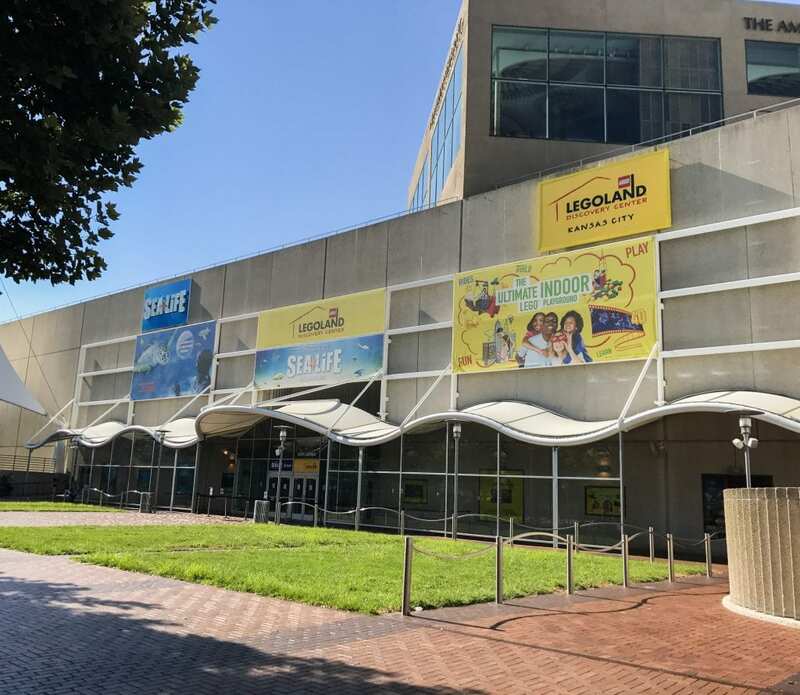 SEA LIFE Aquarium and LEGOLAND Discovery Center are right next to each other. In fact, they share a ticket counter just inside the door. We followed our #1 tip when visiting attractions–get there at opening to avoid the crowds. It was a Sunday, so we felt this was important. 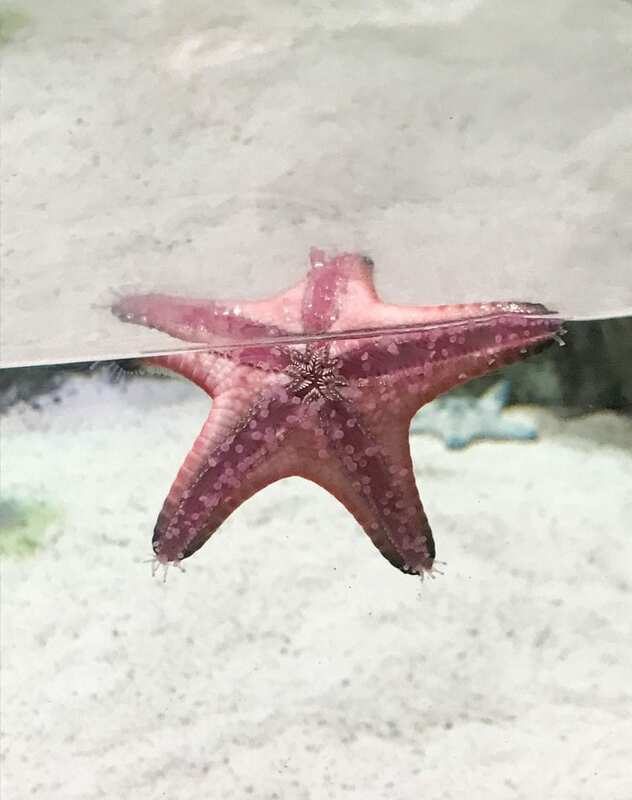 We ended up being one of three families in the aquarium during our entire visit. This is a smaller aquarium, but we had a great time. 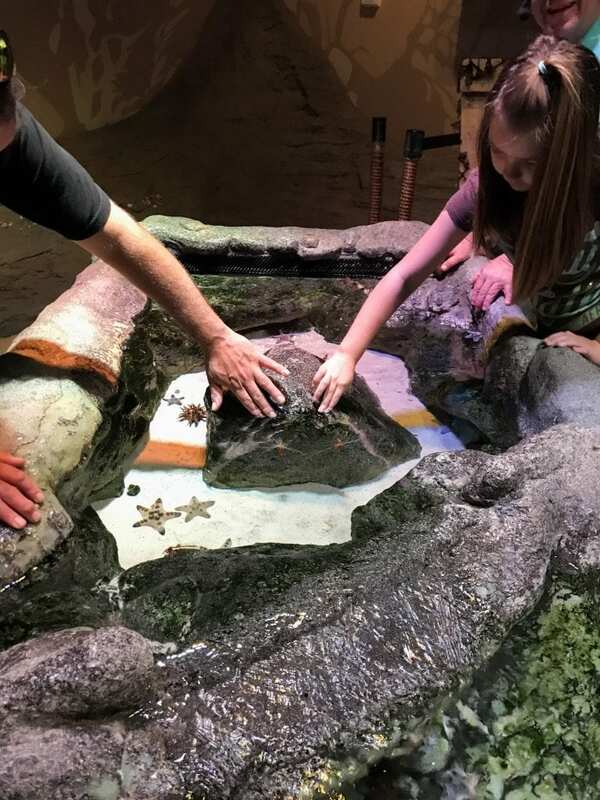 We had the touch-tank to ourselves. The attendant explained what we could touch and how. He told us to put our fingers near the shrimp, and they would come to us to nibble the dead skin off our fingers! He also told us which animals were not open to being touched. I know some people don’t like the idea of zoos and aquariums, but I think learning about the animals and how to protect them is beneficial. Kristin remembers what she learns. 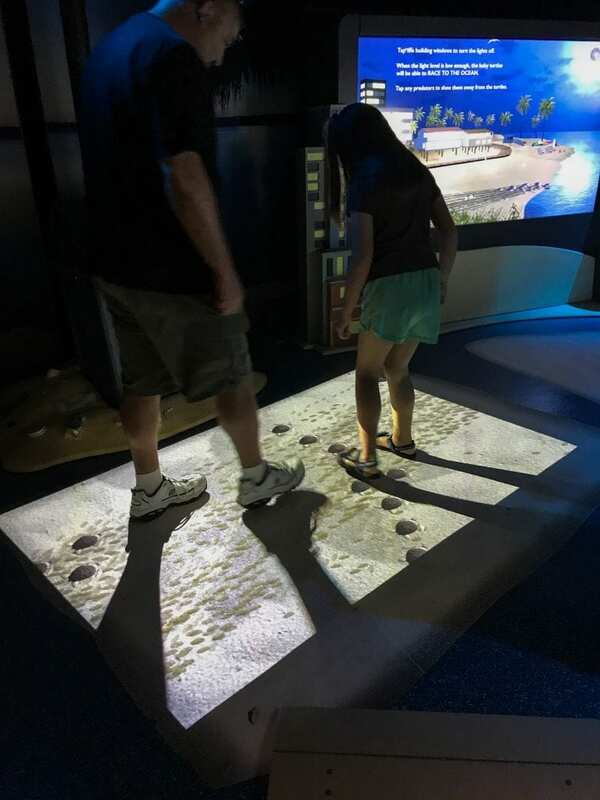 One exhibit explained how to help baby sea turtles get to the sea. 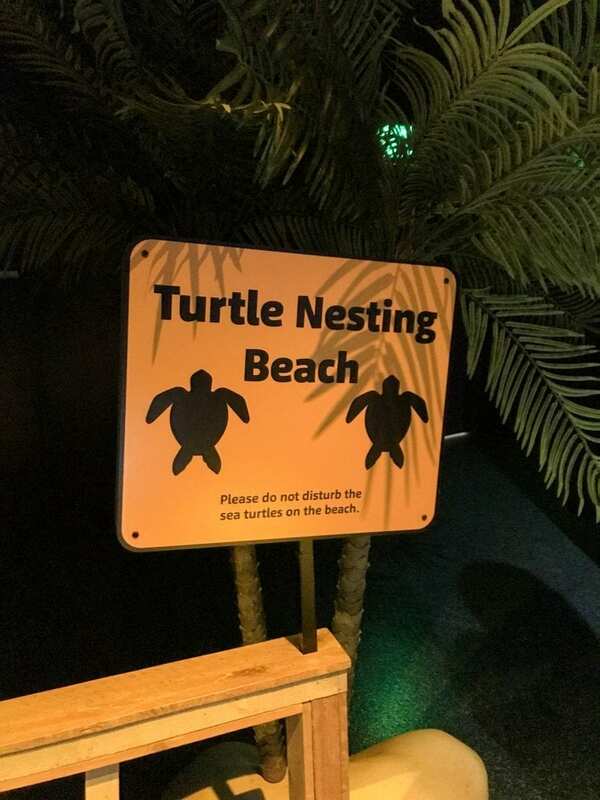 We go to the ocean about once per year, but we aren’t there when the turtles are returning to the sea due to school schedules. Here we got to do activities that showed us the importance of not leaving trash around and keeping the beaches dark at night. 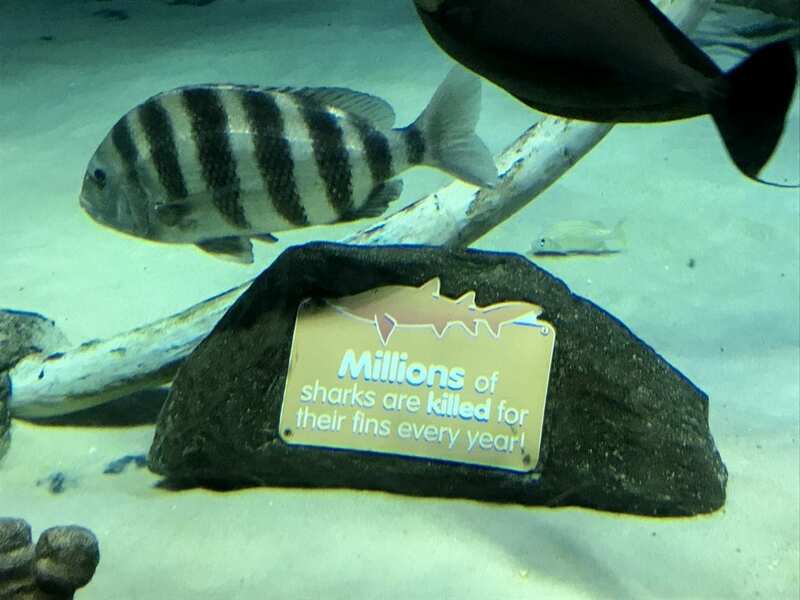 In another area, we learned about protecting sharks that are hunted for their fins. We love seeing the different types of fish! Some habitats are so beautiful. 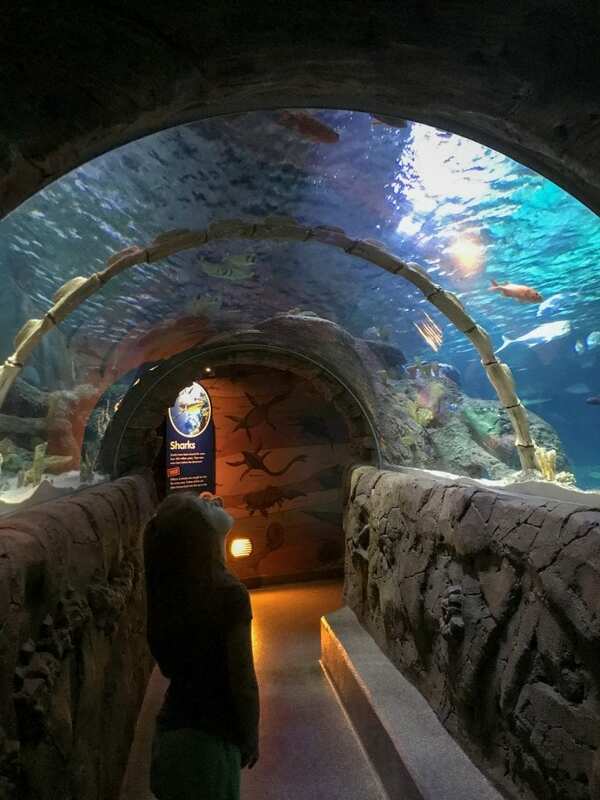 Kristin’s favorite is the shark tunnel. We saw this guy on top of one tunnel. 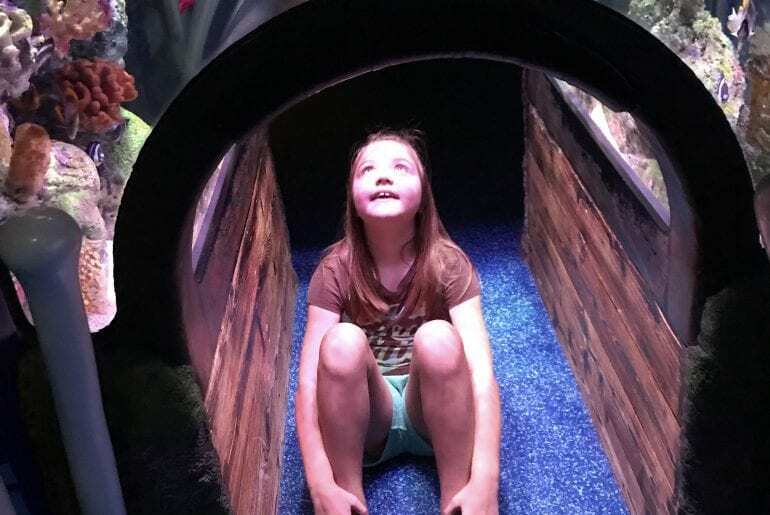 There are a lot of great places for kids to get a good look at the fish. 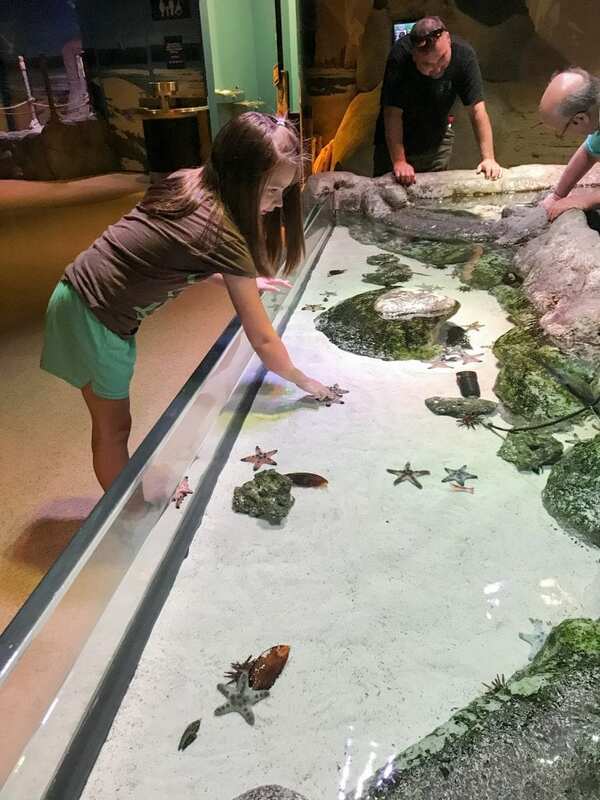 Our family definitely enjoys a good aquarium! 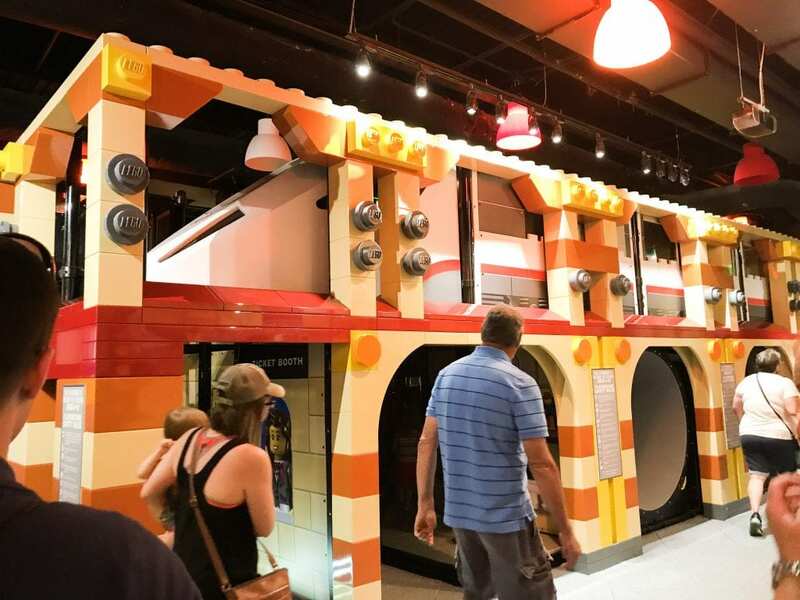 If you have a LEGO-lover in your family, this is the place for you! 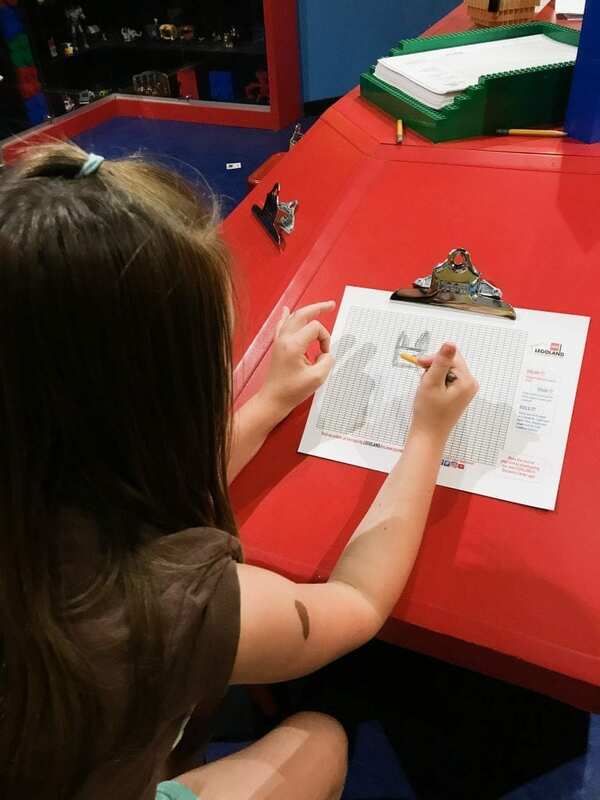 As soon as we finished with the aquarium, we went straight to LEGOLAND Discovery Center. By the time we were ready for this attraction, more people had arrived, but it was still manageable. 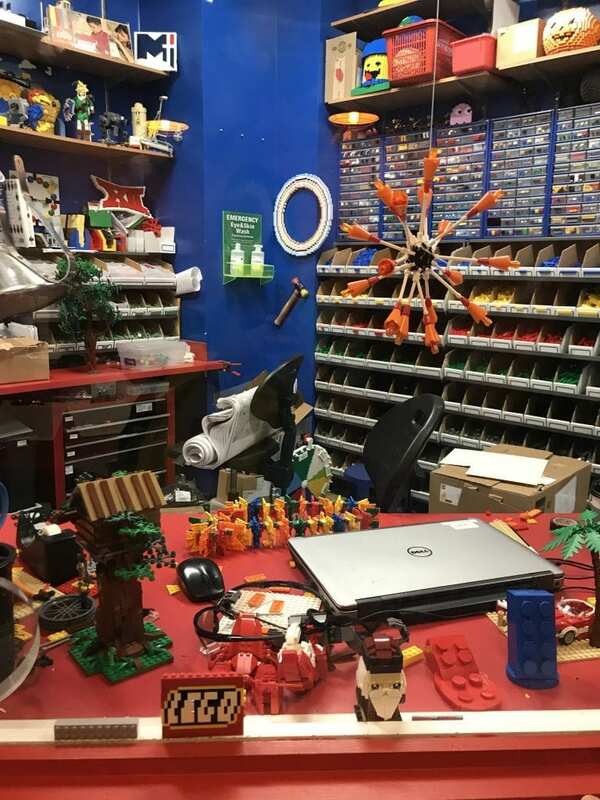 The first thing you get to do is the LEGO Ideas Studio. This is the area where the Master Model Builder gets to create his models. You can see the models all around the room. You can even design your own model. And then you get to create it! Next, we were off to our first ride, Kingdom Quest. This LEGOLAND Discovery Center has a medieval theme, so in this ride, you help the knights save the royal family by shooting bad guys. The rides aren’t extra, and you can do them as many times as you want. 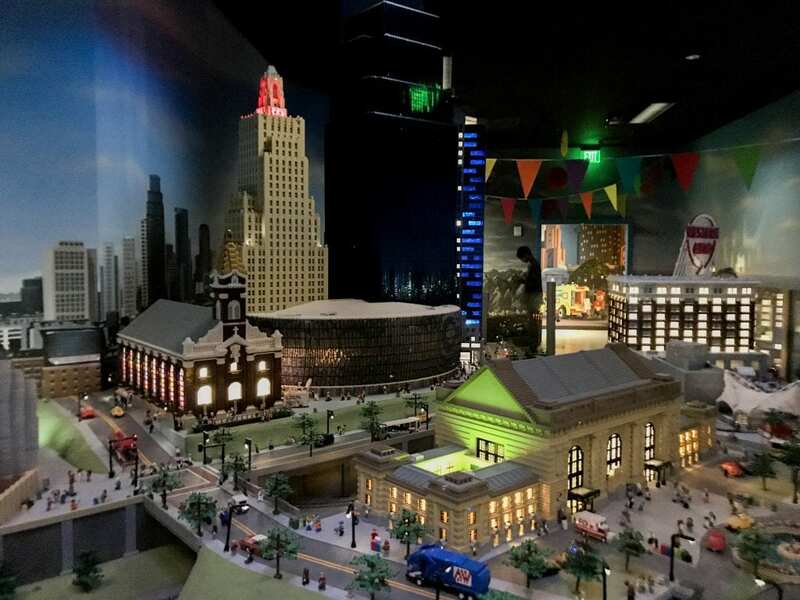 One of the highlights of LEGOLAND Discovery Center is Miniland, a room filled with models of Kansas City’s landmarks and scenes from the Wizard of Oz. The models are pretty amazing. The theatre-lover in me had to include the Starlight Theater. After this room, you have access to all the play areas and the cafe. There’s something for everyone and every age in this area. You can race LEGO cars or build onto various structures. 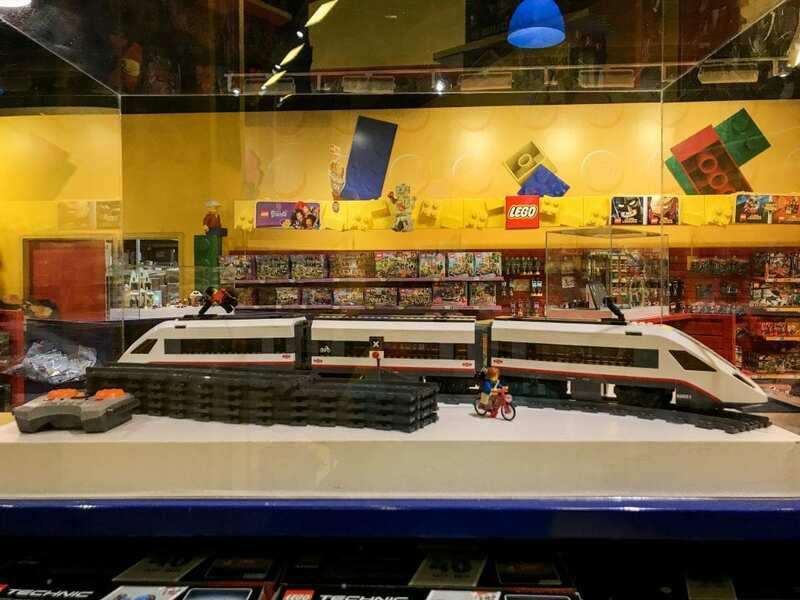 You can play with trains or see if your creation can withstand an earthquake. 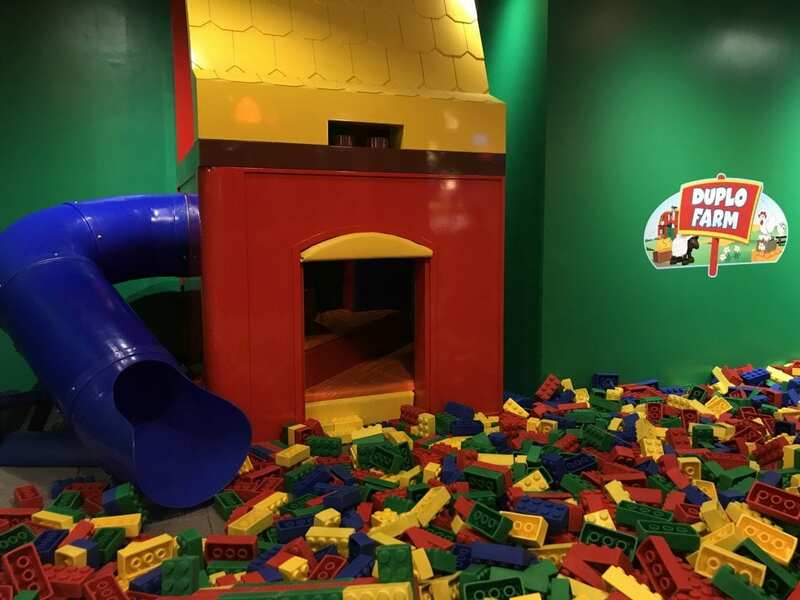 You can also play with huge rubber LEGOs. The 4D movie is in this area. There’s even a little play area themed to the Kansas City Streetcar. It’s also not a bad place to relax! Merlin’s Apprentice, a spinning ride that goes in the air much like Disney’s Dumbo ride is nearby. We also did a laser beam challenge. I was surprised by the number of rides they had. 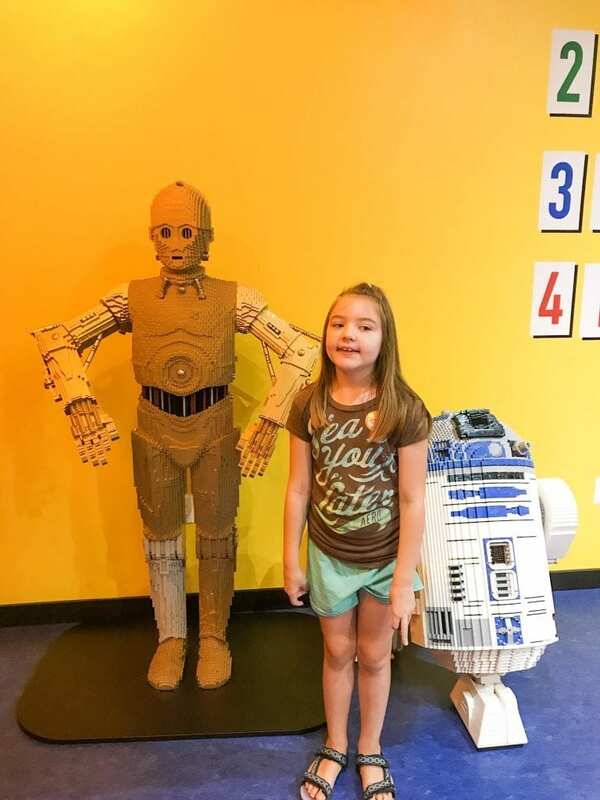 If you’re in the New York area and would like to visit the LEGOLAND Discovery Center in Westchester, one of my favorite bloggers, Momma to Go, shares her experience in the link above. On the way out, be sure to check out the shop. 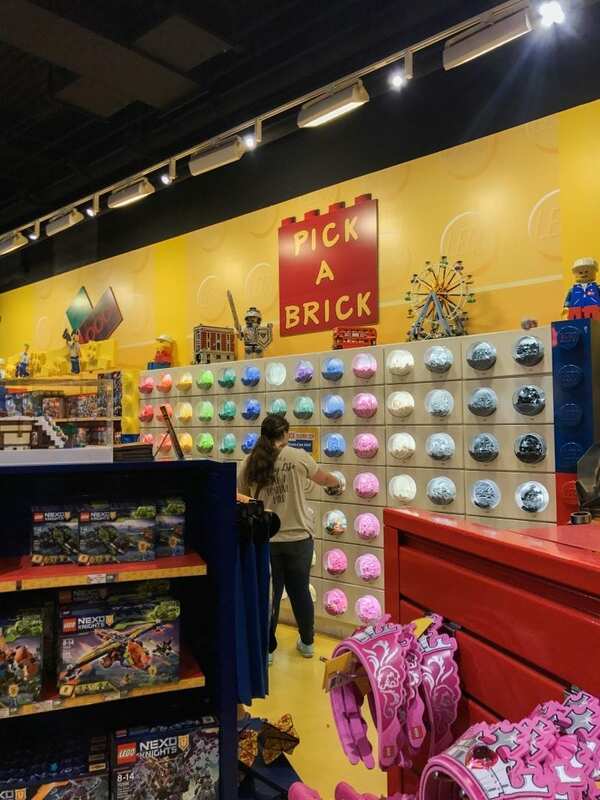 You can purchase bricks by color. And they have some unusual sets. 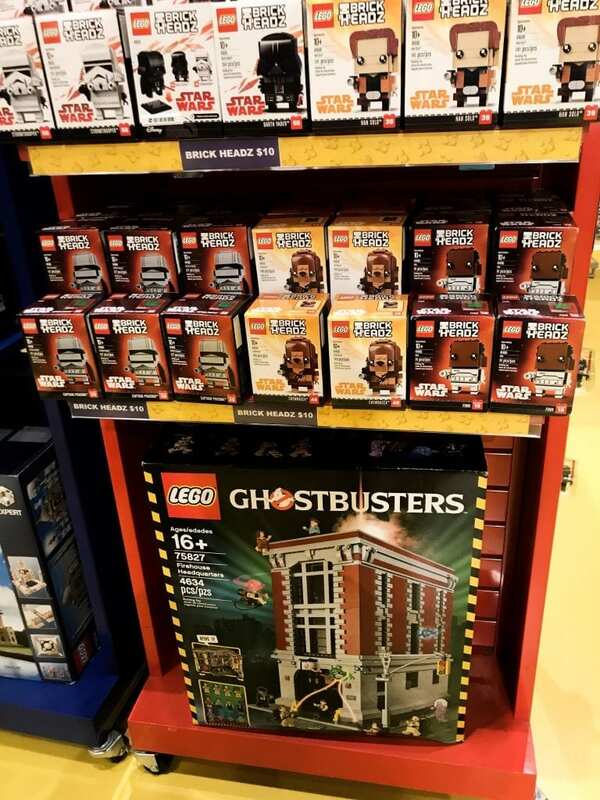 I wouldn’t mind the Ghostbusters one! After we finished looking around, it was 11:00 a.m. On Sundays, that meant that many shops and restaurants would be opening across the street. Lunch time! 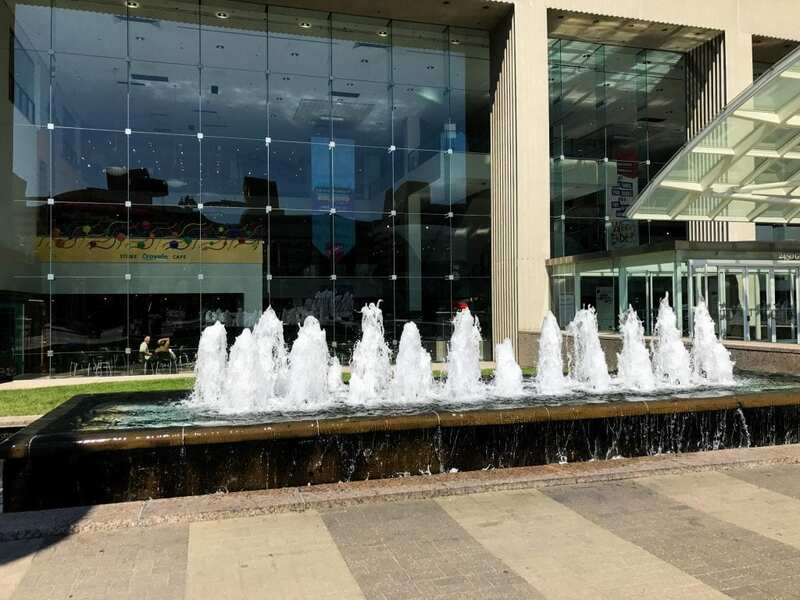 Crown Center has some great restaurants and cafes. They even have a place where you can sample some Kansas City Barbecue. 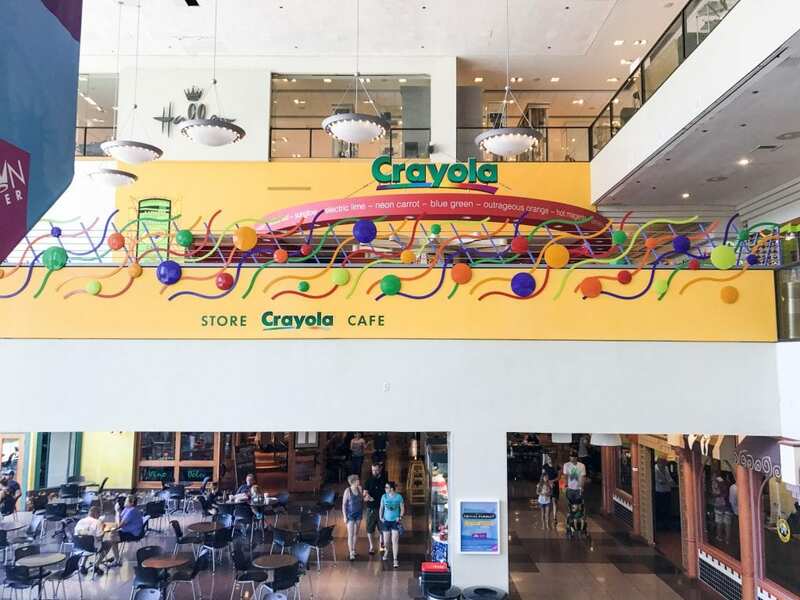 Crayola has a cafe. There is truly something for everyone. 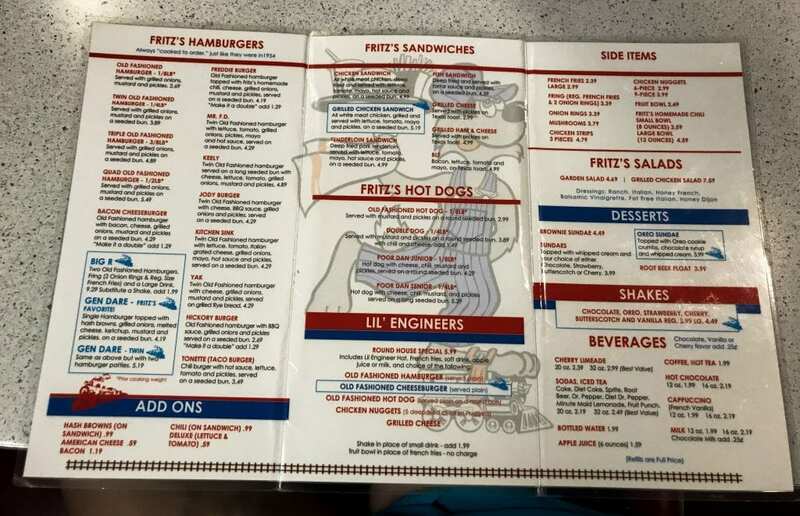 But if you’re here with the kids, you should definitely check out a unique little place to eat called Fritz’s Railroad Restaurant. This place is adorable! 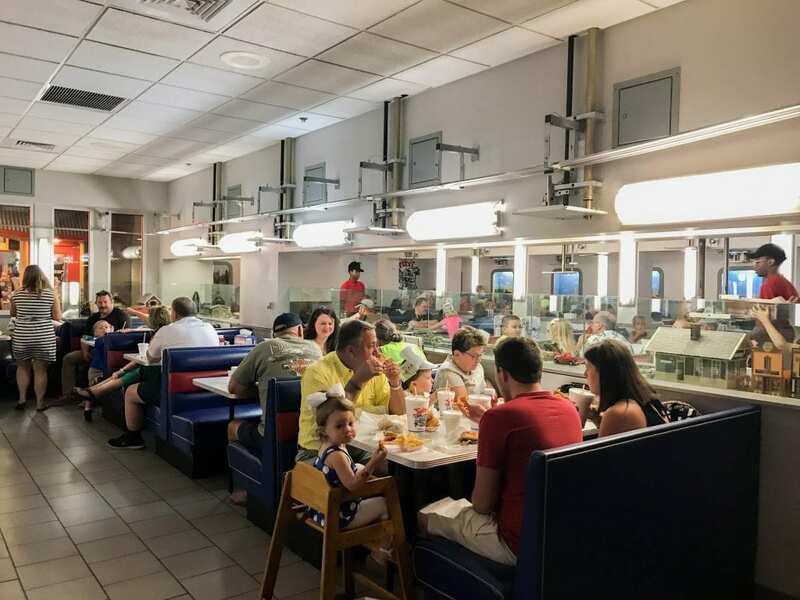 The dining area looks like the interior of a dining car. When you are seated, you’ll notice a little black phone at your table. 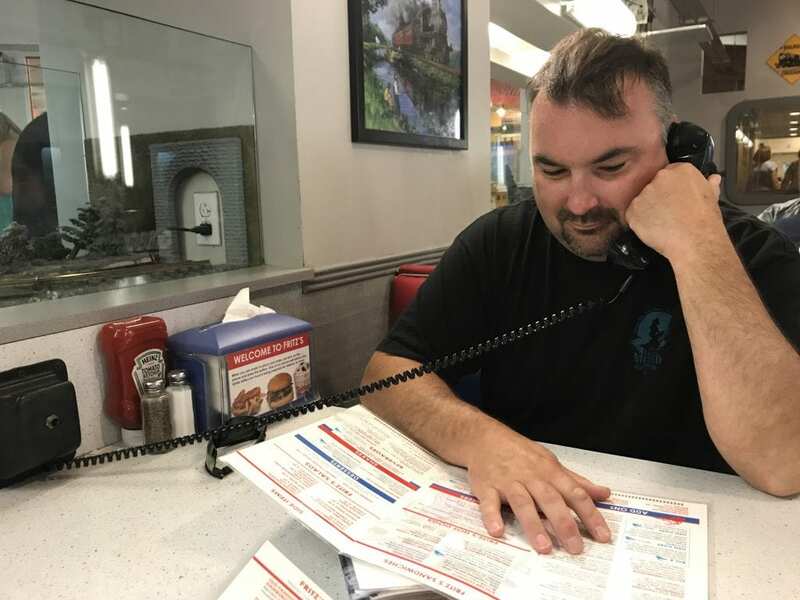 The host will explain that you use the phone to place your order. How cool is that? And that’s not even the best part! 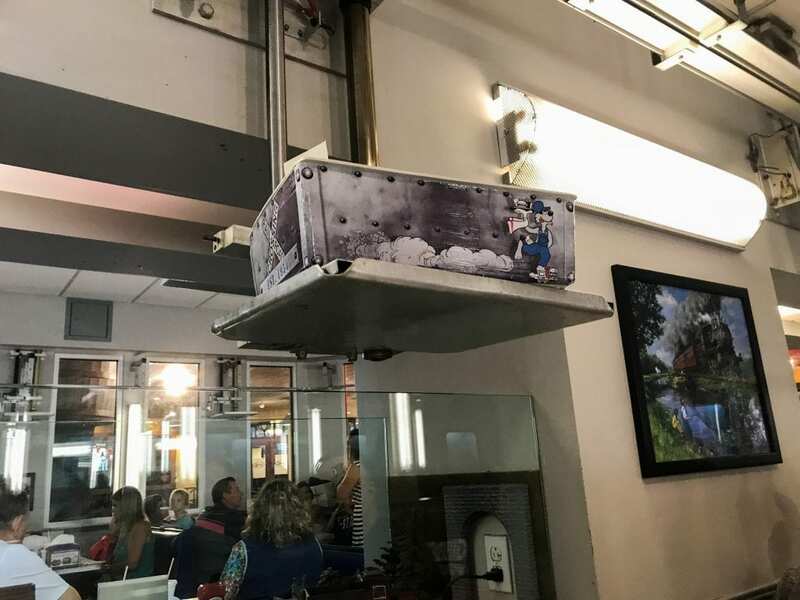 When your food is ready, a little train travels overhead and delivers the food! 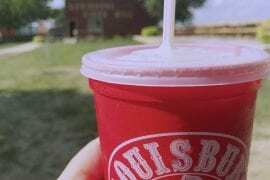 When the train gets to your table, it drops a little box containing your order–except drinks. A person brings those. 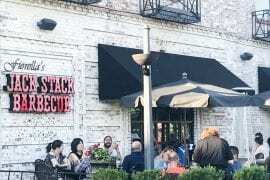 The food is standard diner fare, and I promise we don’t eat this way all the time. 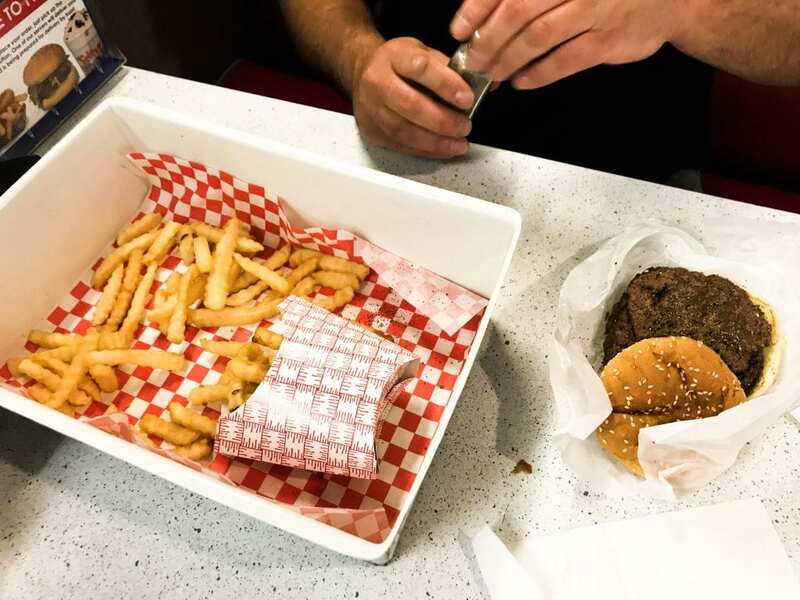 Here’s Jeff’s plain hamburger with fries. 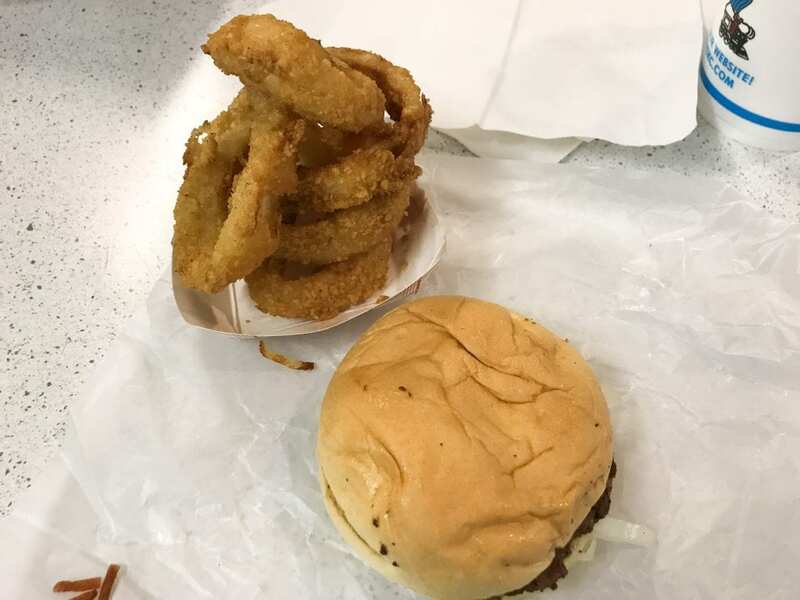 Here’s my hamburger with onion rings. 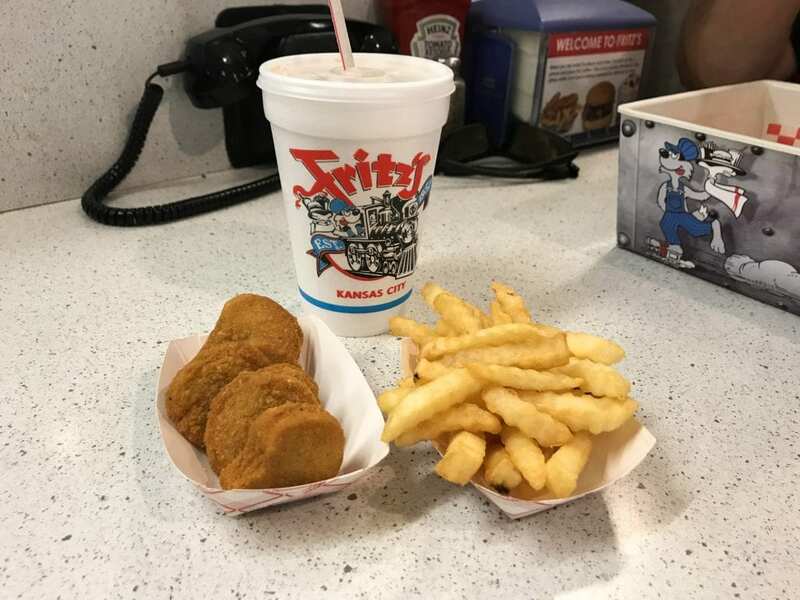 And here’s Kristin’s kid’s meal of chicken nuggets with fries. 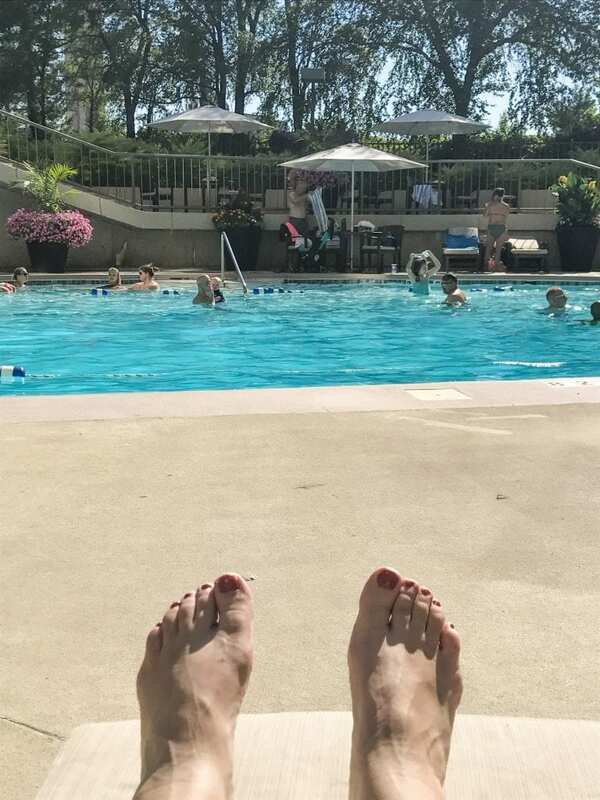 If you’d like to try some places away from Crown Center, one of my favorite bloggers, Everyday Wanderer, has some dining suggestions for the Kansas City area! After eating, we were ready to do some shopping! Crown Center really has some unique shops, and again, there is something for everyone. Kids will probably like the toy store and the Crayola store. They had some unusual products, and they are kid-friendly! One of my favorite stores was Function Junction. They had all kinds of kitchen gadgets. I especially loved these Disney dishes! Chip’s Chocolate Factory is also a highlight. 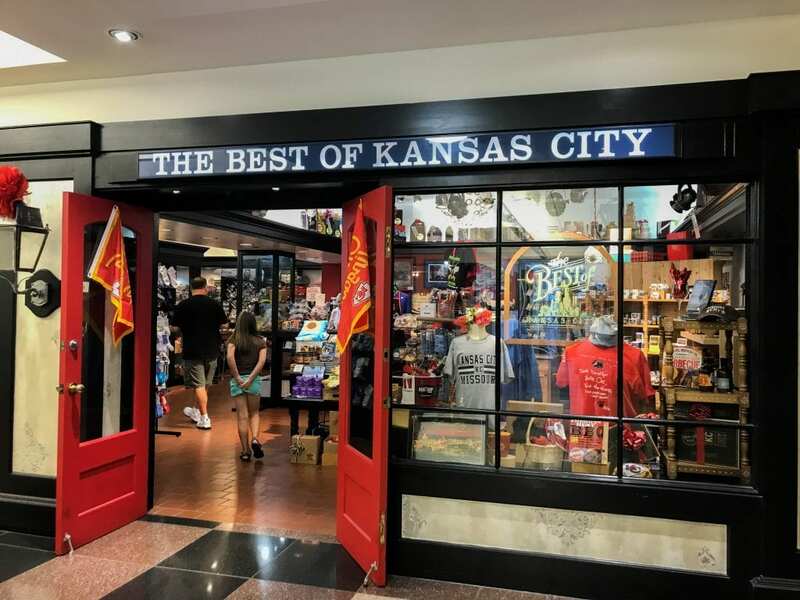 Jeff and I really loved the Best of Kansas City Store. 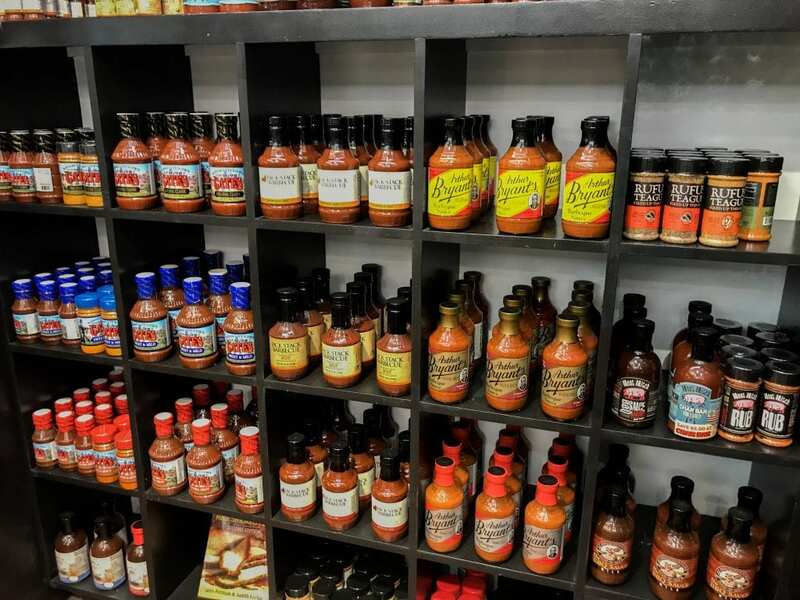 You can even buy the barbecue sauces and spices from famous Kansas City barbecue places around the city. I’ll just give it to you straight. 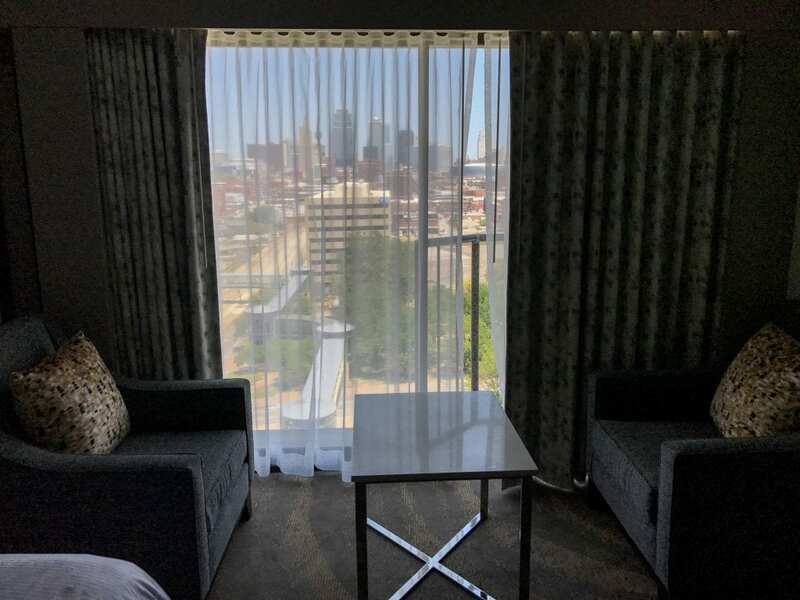 If you are going to spend a significant amount of time doing things in Crown Center in Kansas City, do yourself a favor and stay at the Westin Kansas City Crown Center. 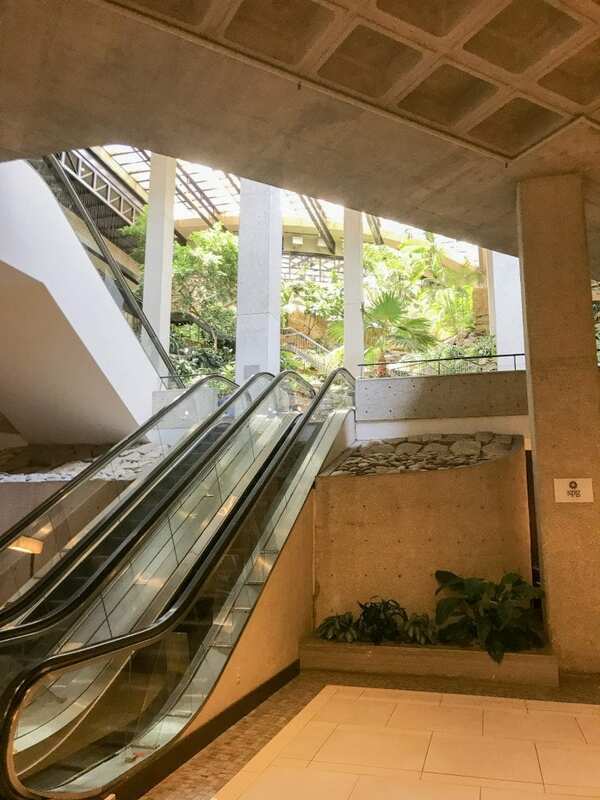 This hotel is actually attached to the Crown Center shopping and dining complex, and you can take the covered skywalk to Union Station. More on that in a moment. 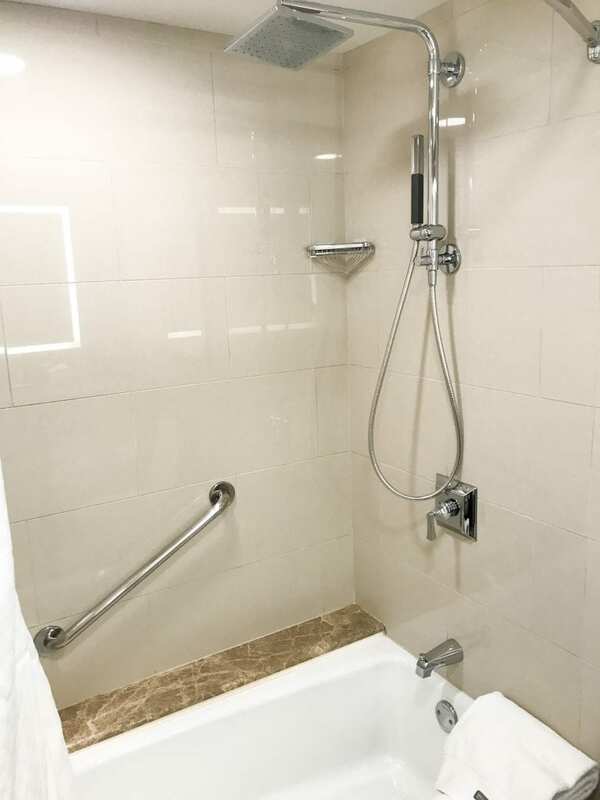 You can probably save a few dollars staying a little distance away, and we often go this route, but this hotel is just so convenient. Once we checked in, we really only used our car in the evenings to visit the Country Club Plaza and a couple of other landmarks. We were able to walk to many activities right from our hotel room. Below you can see the skywalk to Union Station. You would also use this skyway to access the free Kansas City Streetcar. 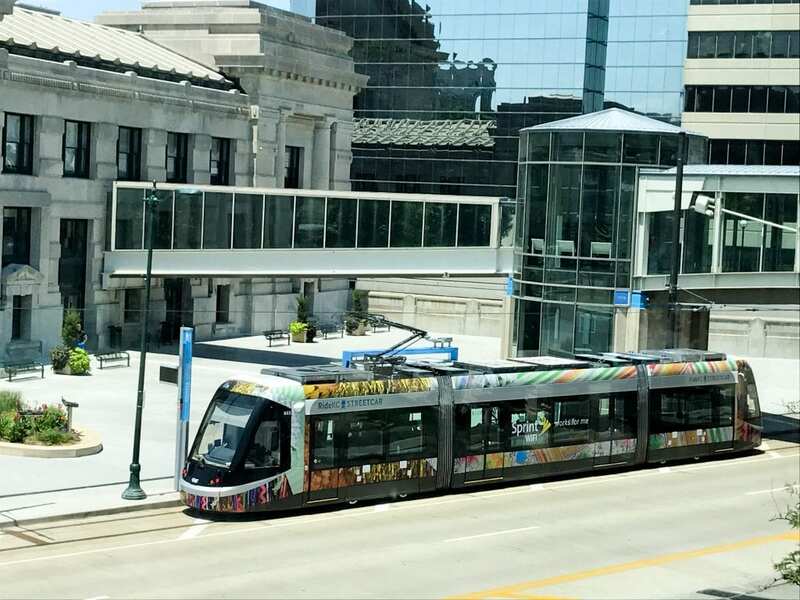 The streetcar is ideal to get to City Market, the Steamboat Arabia Museum, the Crossroads Art District, and downtown to the Power and Light District. The Kansas City Convention Center, Kauffman Center, and Sprint Center also have stops along the route. We even stopped at the Kansas City Public Library. The lobby of the Westin is large and beautiful. You have to get a picture at the waterfall. 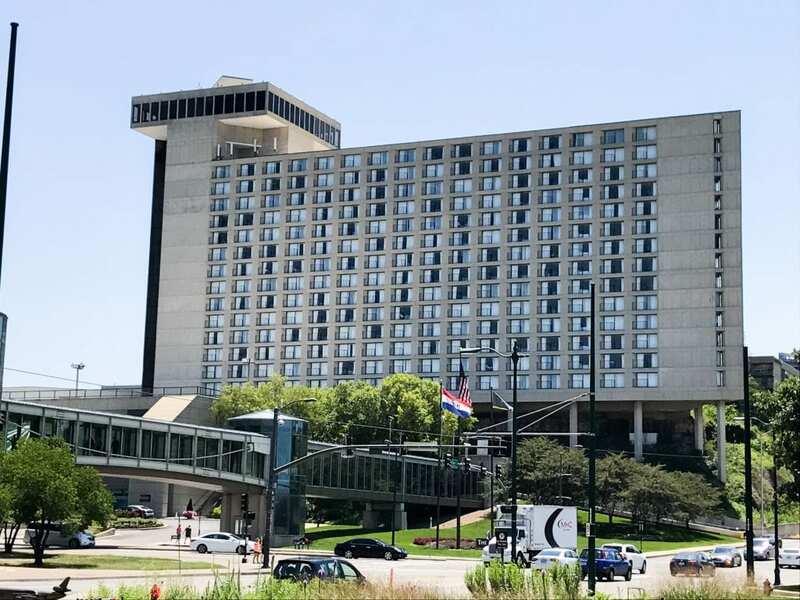 Even if you don’t stay at the Westin, you can park in the Crown Center parking garage for a fee and use the walkway to Union Station. 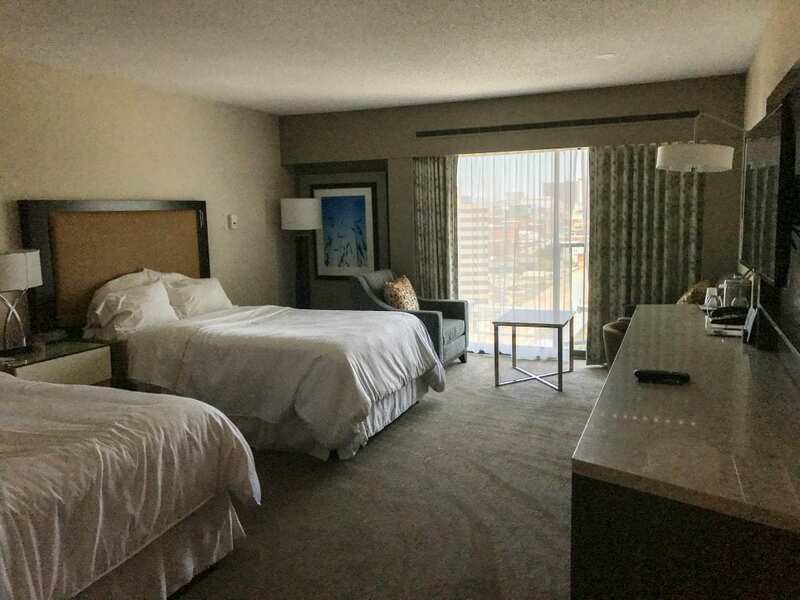 We asked for a room facing downtown, and our request was granted. We were on the twelfth floor, and we loved our view. The little sitting area was nice. Here are the beds; I’m pretty sure Kristin ran in and jumped on the beds a little before these pictures. We did have a refrigerator but not a microwave. We may have been able to request one, but we spent so much time sampling nearby food that we didn’t need it. They did provide a little coffee station near the bathroom. The shower was nice! We spent plenty of time admiring the view during various times during the day. And here’s a view of Union Station from our room. 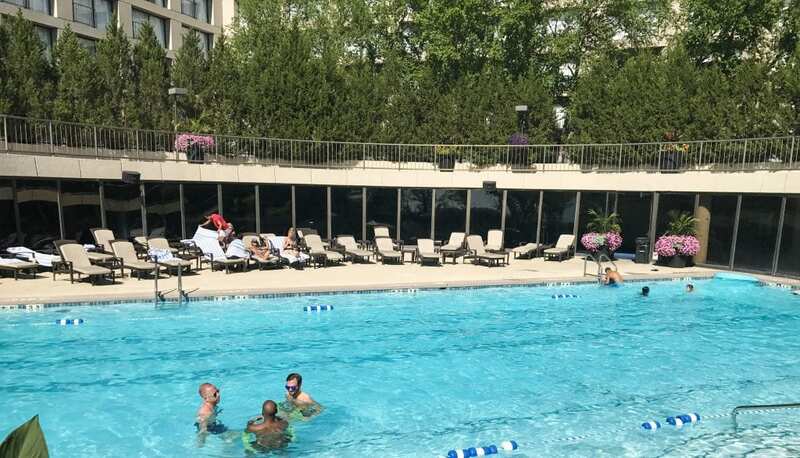 You’ll also want to make time to check out the pool area. It’s the perfect place to relax after visiting the attractions nearby! 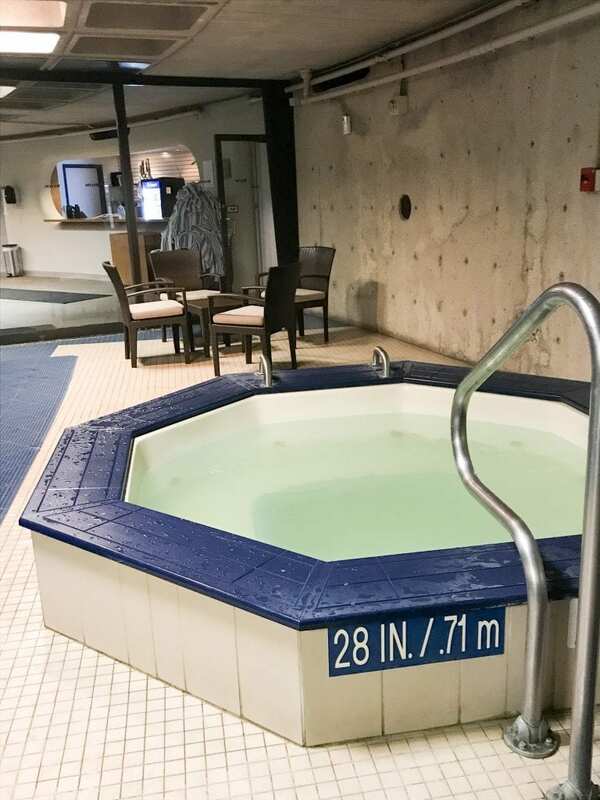 If a hot tub is more your speed, hop on in! 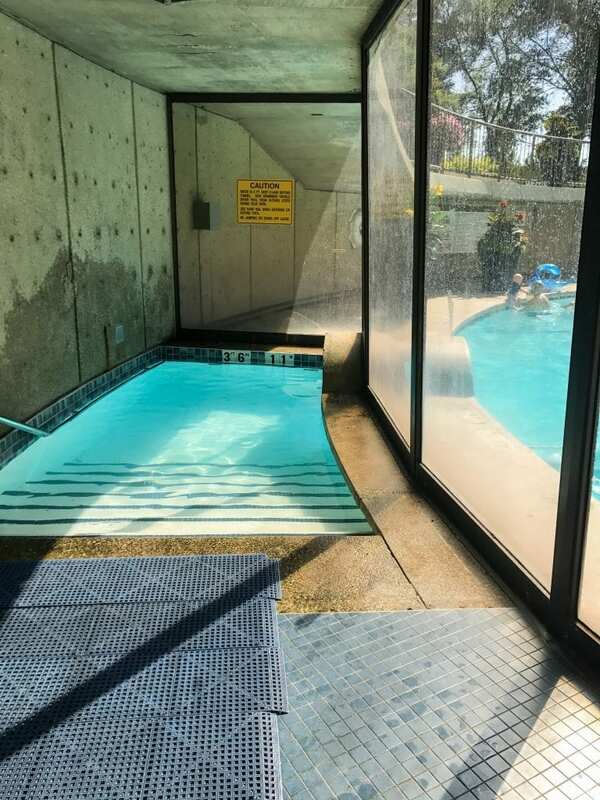 They also have a really small indoor pool that connects to the main pool. 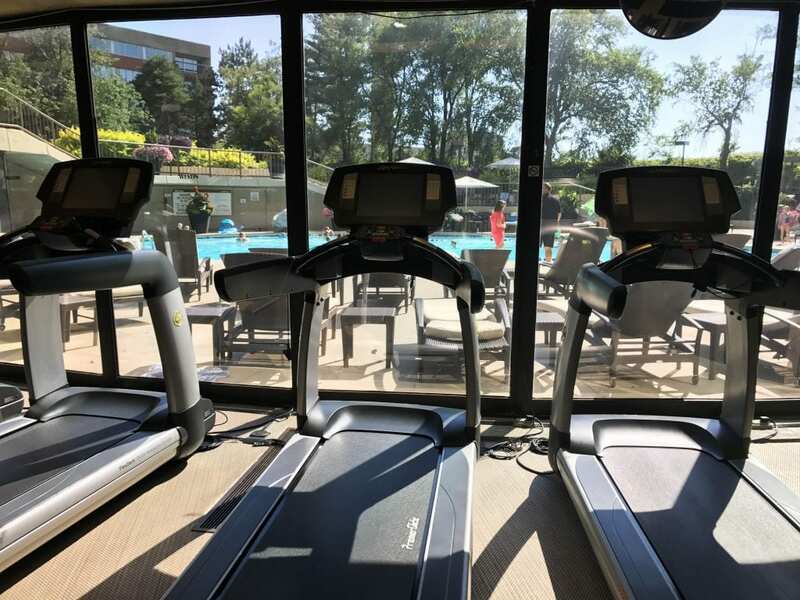 The exercise room overlooks the pool. 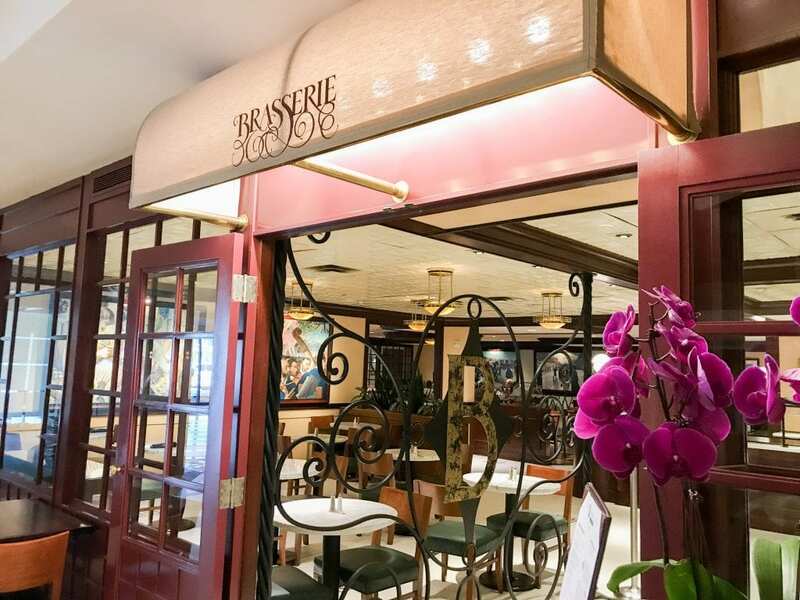 They do have a restaurant on site, but you are also just steps away from the restaurants at Crown Center. 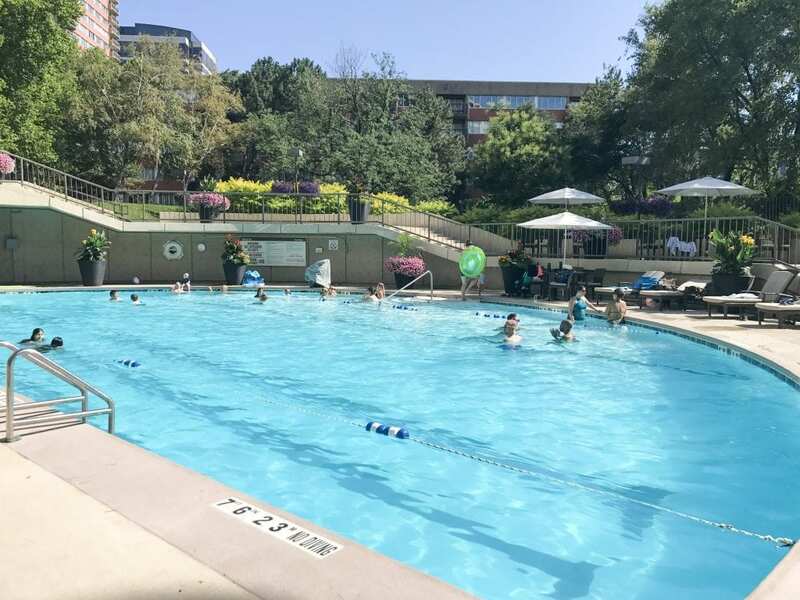 This really is the ideal place to stay to be close to Crown Center and the other nearby attractions. 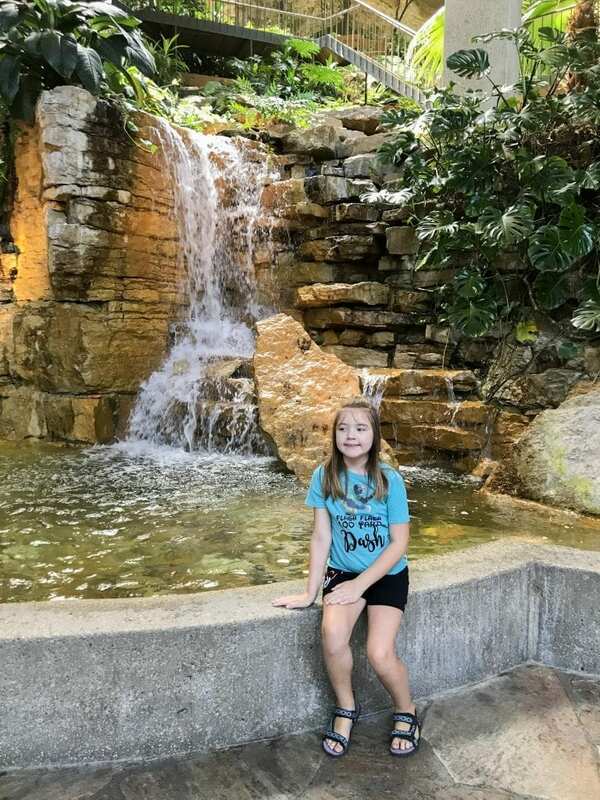 We had a great time using Crown Center in Kansas City as our “home base.” Though we did venture out in the evenings, it was so nice to be near everything during the day. I even took a night stroll over to Union Station on our second night, and it was so nice to just walk over from my room. Crown Center really does have a lot to offer families. Nothing felt too far away, and we even used the streetcar to go to the City Market and the Steamboat Arabia Museum. 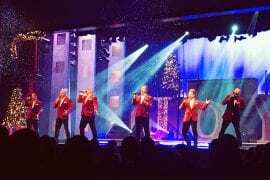 I hope you’re ready to bring your family to Crown Center in Kansas City! Wow, this really is the ultimate guide! There looks like SO MUCH to do – ive never been to Kansas, or that part of the country! This looks like the perfect weekend getaway for families! 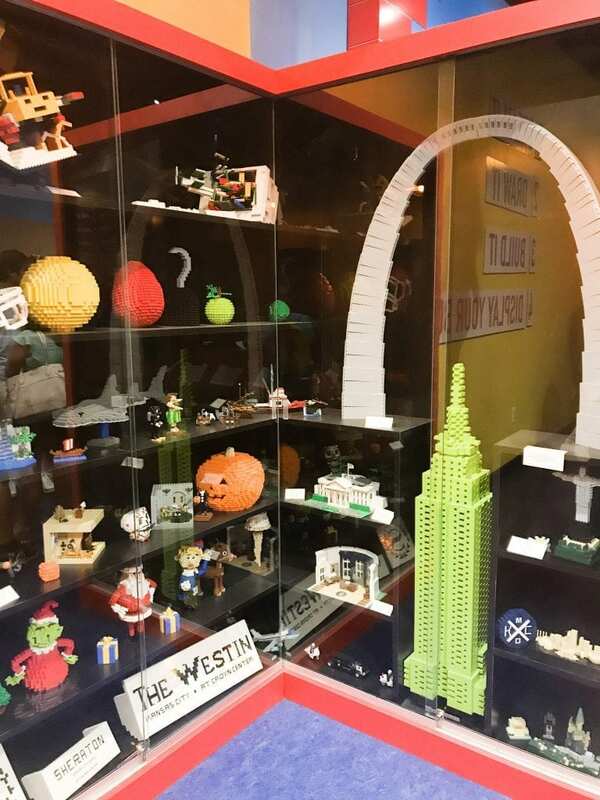 I have a few conferences to attend in Kansas City and now I know that I can bring my kiddo along for some fun! p.s. 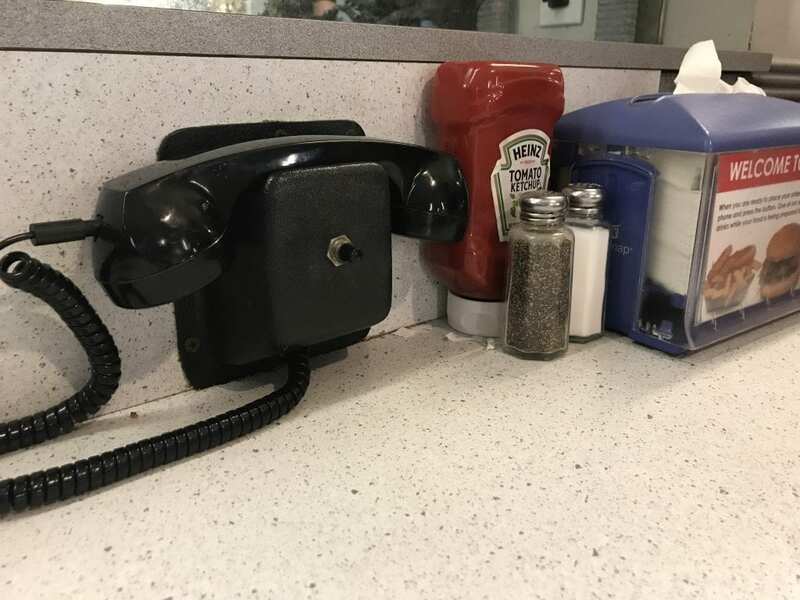 LOVE the phone at the diner. Looks like a fun novelty. 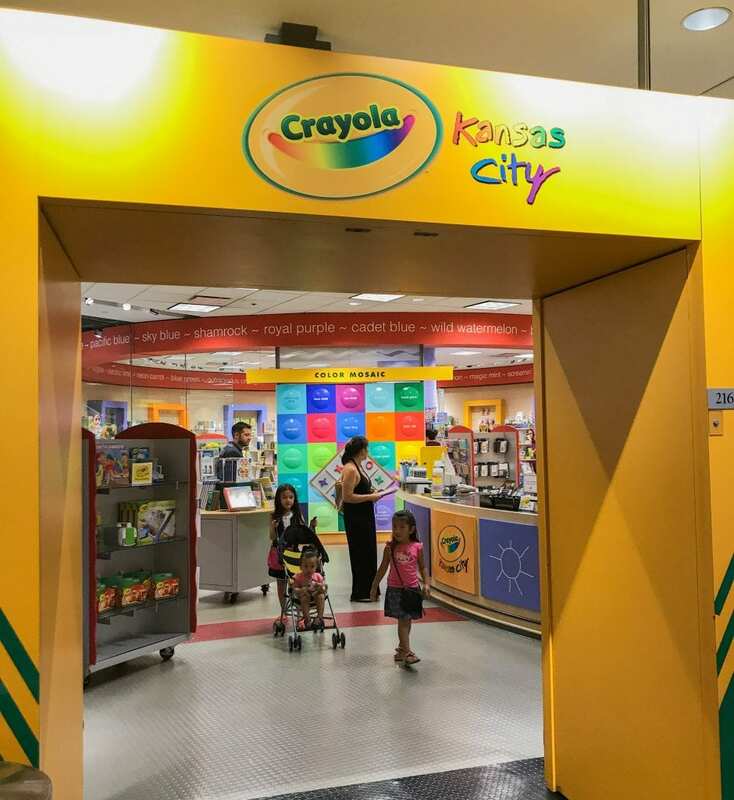 Yes, there is a lot for kids to do in Kansas City! 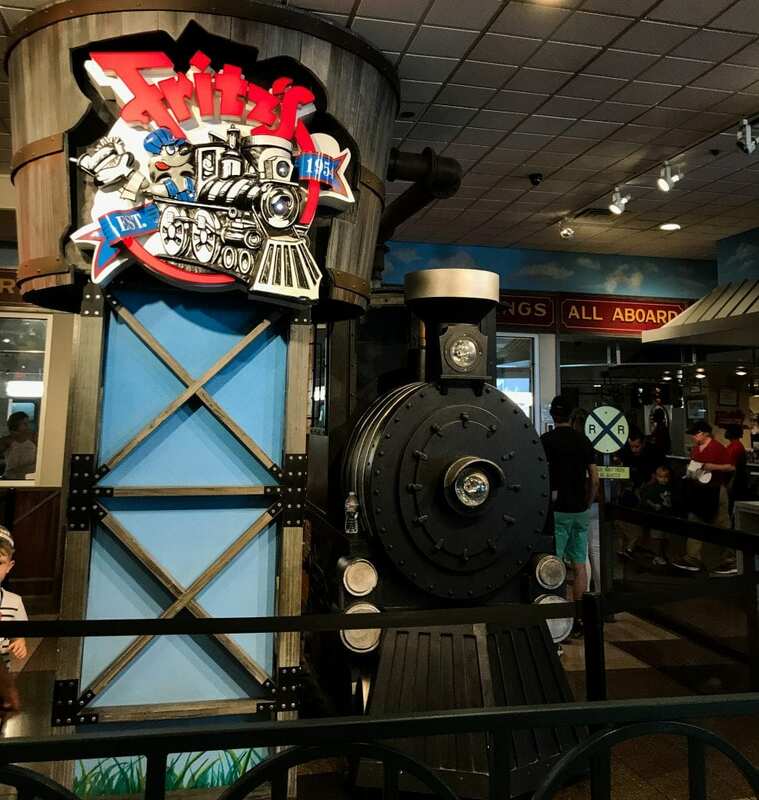 What a fun family place – my kids would love all of that – especially the aquarium and the restaurant that delivers via train. Super cool! 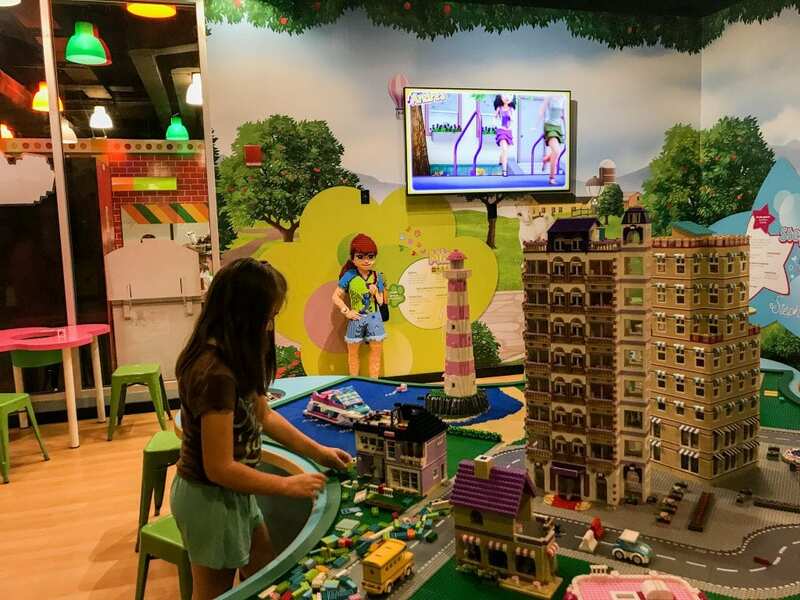 It is a fun place for kids! What a fun adventure! That railroad restaurant looks like a blast. 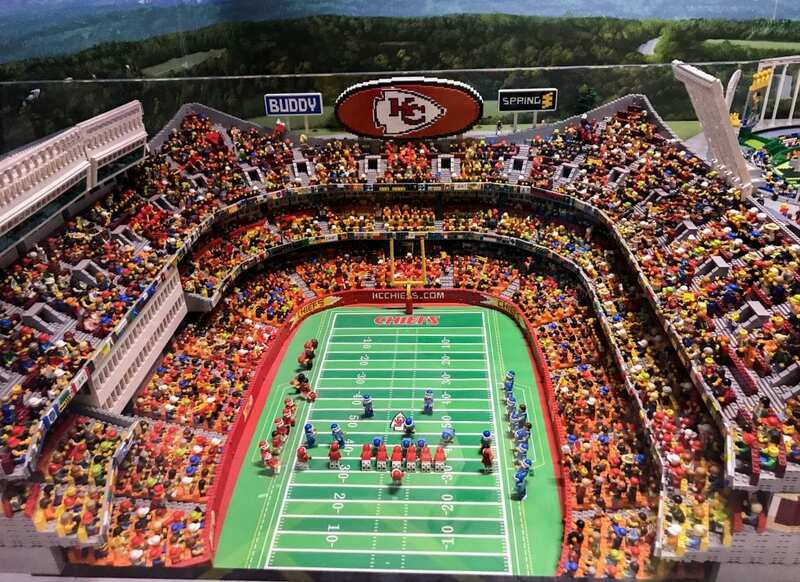 I have never been to Kansas City but this made me want to go! You should go to Kansas City if you ever get a chance! My sister lives in Overland Park, so I am excited to go visit and head over to the Crown Center! You should! It’s a great place to spend the day! How fun! 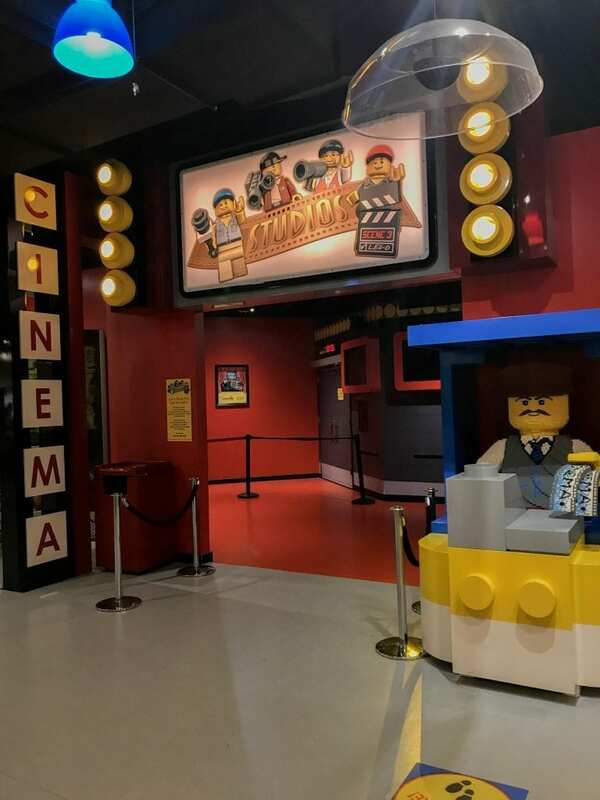 I never heard of Legoland Discovery, my children would love that:) Great pictures! 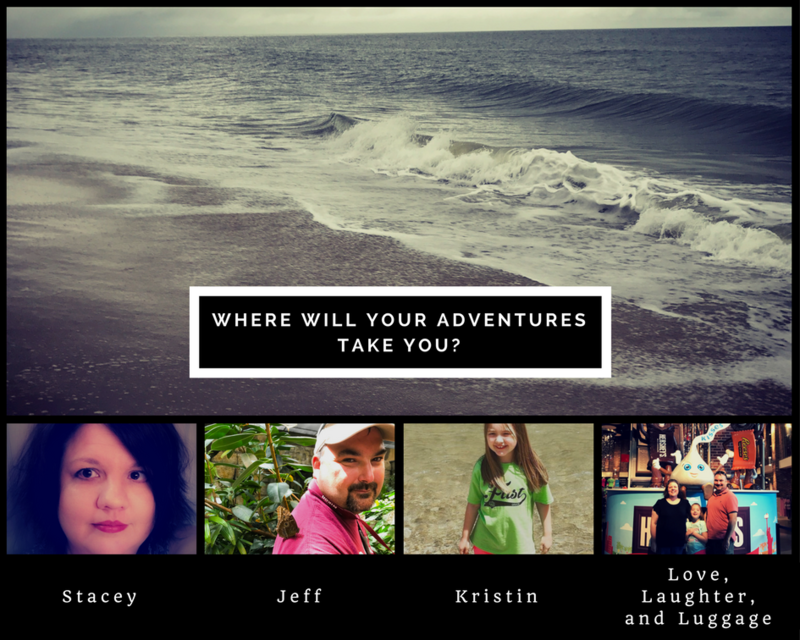 What an awesome adventure for your family. I love aquamarines and (SHHH) love Lego Land. Sometimes I wish I still had little ones to give me an excuse to go to places like this. They are certainly fun places to take kids! Wow, this places looks awesome! So many fun things to do. My kids would love hanging out here for a weekend… or more! OMG it all looks awesome! I’d love to see Fritz’s! It is such a fun restaurant! What a lot of great information! I would love to spend a vacation there! 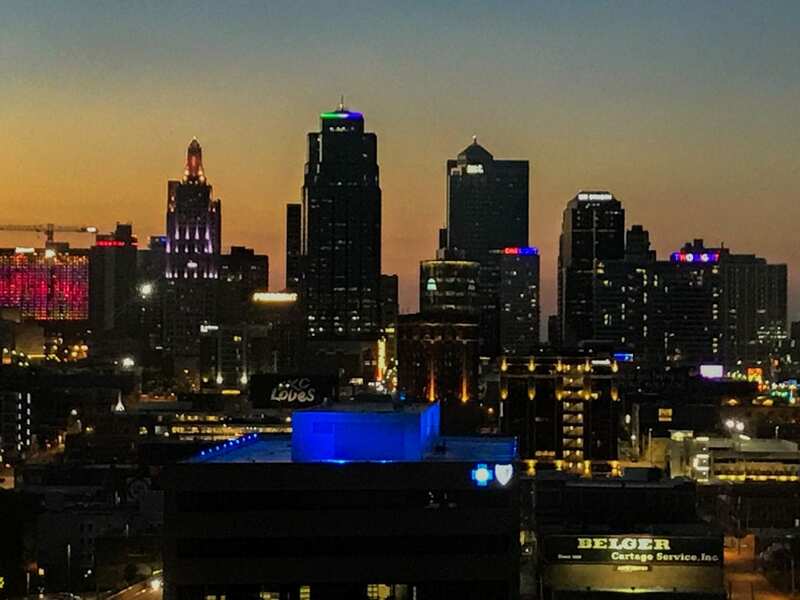 Kansas City is a wonderful place to visit! 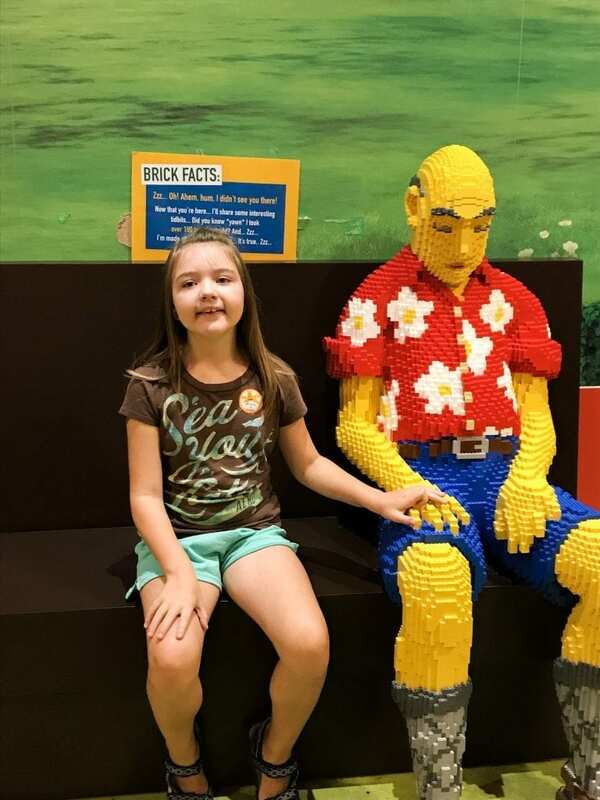 Lots of Lego…. my kids and my big kid (aka hubby, lol) would fall in love with this place. 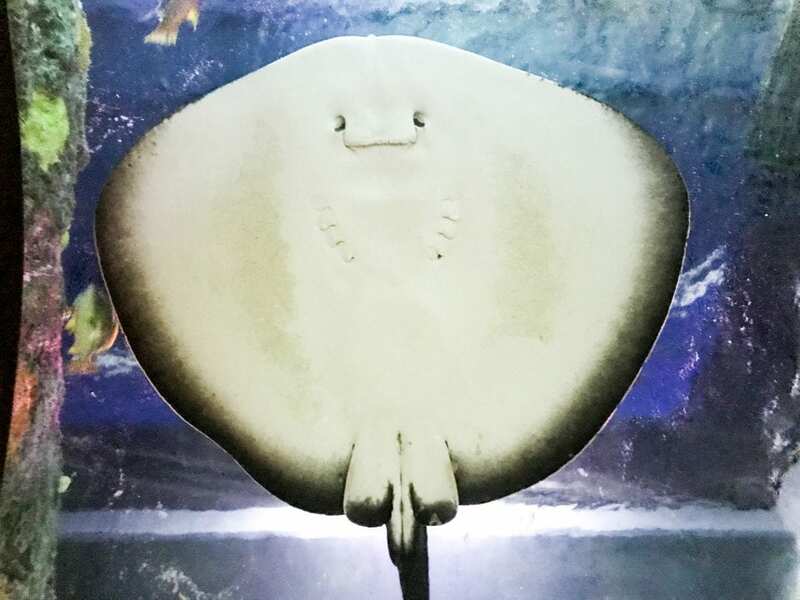 The stingray looks like he is smiling. Wow! 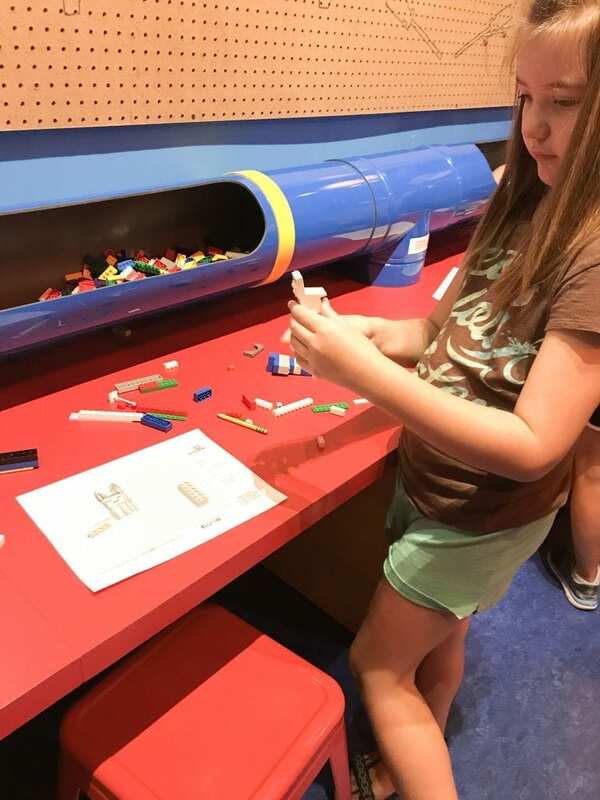 thanks for sharing, I am always looking for fun things to do with the kids! Your photos are so cool!!! 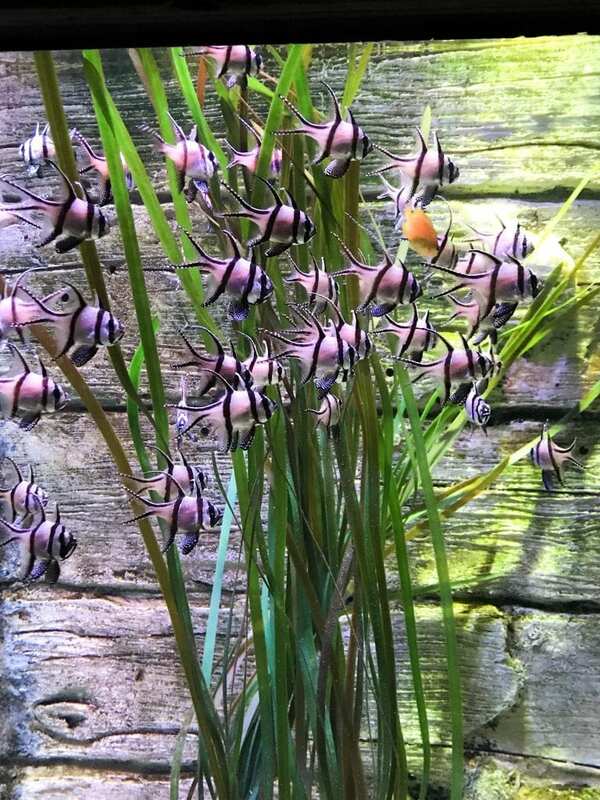 It makes me want to go to see that aquarium! I love when a hotel is located near so many attractions. It makes traveling with children so much easier! We are an Aquarium family and a Lego family, so I’m pinning this for our future US road trip. That sting ray photo is THE BEST. Thank you! We thought it was cute. Wow! What an adventure! So much to do!! 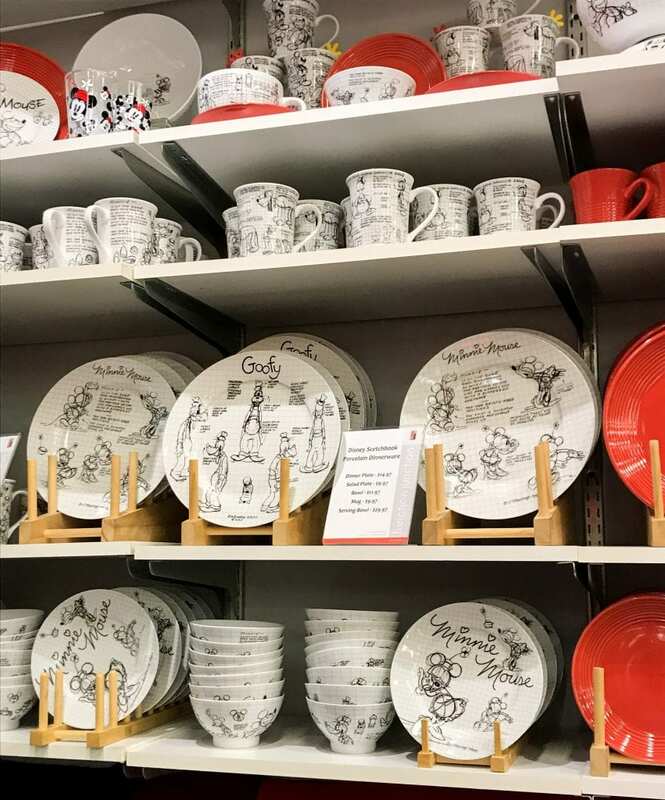 I’ll tell you, though ~ those Disney-themed dishes would have been coming home with me! LOL. 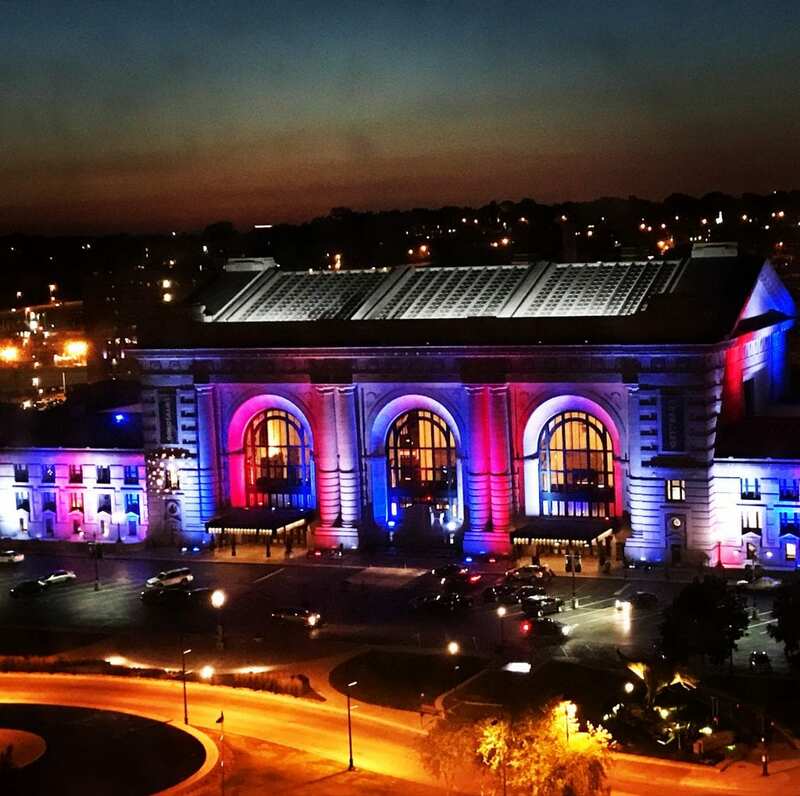 I also love the picture of Union Station at night – gorgeous colors! 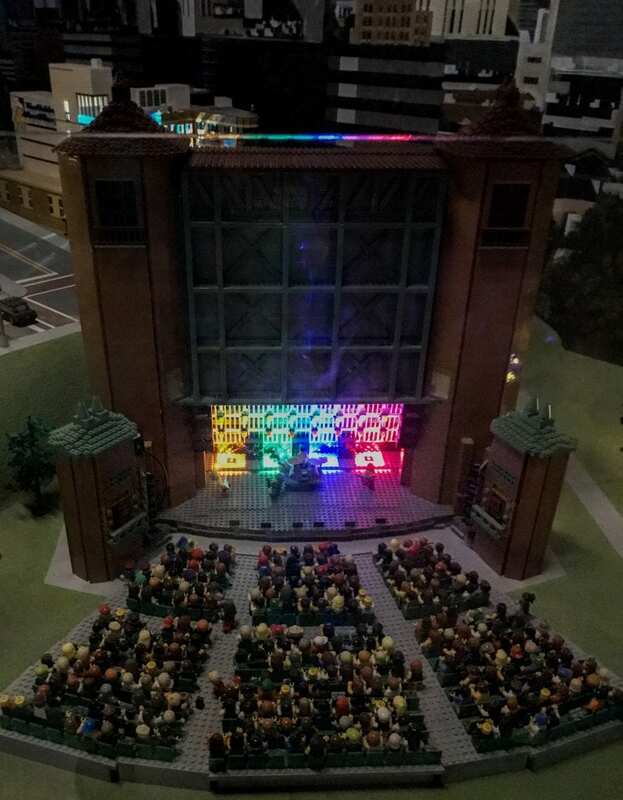 I love the lego theatre!!! This looks like such a great place for a family vacation! It really is a wonderful place for families! Sounds like a great family vacation! It’s a great place for families to explore! True! That’s our deal on our trips. We take turns doing what we each want to do, even if a given activity is not our favorite. We want to make it enjoyable for the person who’s into it!